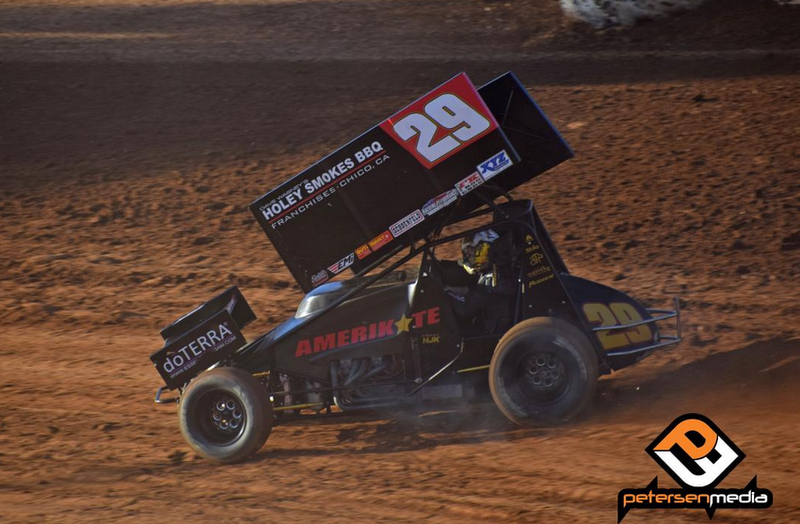 PETERSEN MEDIA- Kicking the Sprint Car Challenger Tour season off on Saturday night at Placerville Speedway, a good start to the night would unfortunately go south for Roseville, CA’s Willie Croft. A strong field of 32 cars checked in to kick off the third season of Sprint Car Challenge Tour action, and Croft would open his night up by timing the Holey Smokes BBQ/BulterBuilt/Brown and Miller supported entry in fourth quickest in his time trial group. Lining up on the front row of his heat race, Croft would get the jump as he had Shane Golobic in tow. While Golobic was able to close in on him in the closing laps, “Double Down’ would have none of it as he held him off and picked up the win. By way of the popular heat race win, Croft would transfer into the High Sierra Industries Dash where the six pill placed him in the third row for the shootout. After a good start to the night, the Dash would prove to be the beginning of Croft’s misfortune on this night. Getting out of shape in turn two, heavy fact to the rear of his car would ensue as he looked to get corrected and it would result in him being credited with a seventh place finish as he was forced to the work area. Taking the green flag from the seventh starting position for the 35-lap feature event, Croft would run well inside the Top-10 during the opening stages of the race that would be riddled by cautions and stoppages. A restart on the ninth lap would see cars bounce around in front of Croft, as he would then feel contact from the rear by another competitor and it would cause damage that forced him to stop. The damage would prove too be too much to get repaired in the work area, and a night that started so well would come to an early end. 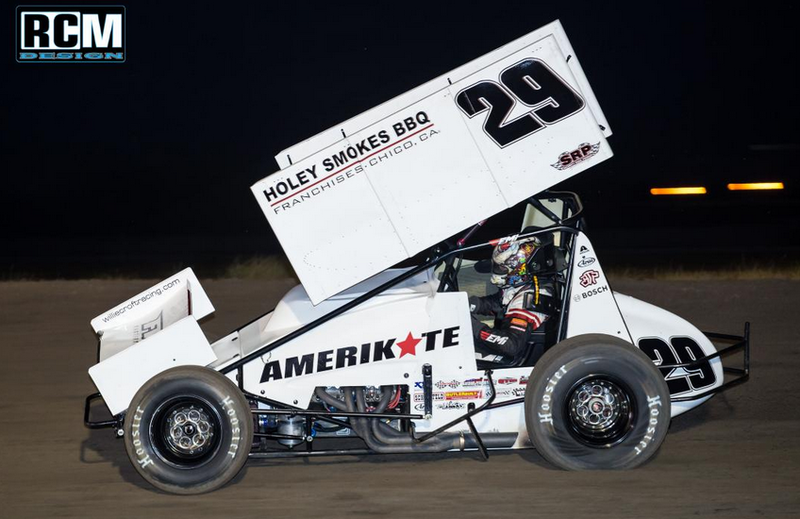 Willie Croft Racing would like to thank Holey Smokes BBQ, ButlerBuilt , Brown and Miller, FK Rod Ends, Factory Kahne, Schoenfeld, Team Simpson, Stilo, Smith Precision Products, Kaeding Performance, AL Drivelines, XYZ, Vortex Wings, Amerikote, DoTerra and GUTS for their support in 2019. 2019 BY THE NUMBERS: Races-6, Wins-0, Top 5’s-0, Top 10’s-0. ON TAP: Willie Croft will kick the 2019 KWS/NARC season off on Saturday night at Kern County Raceway Park. 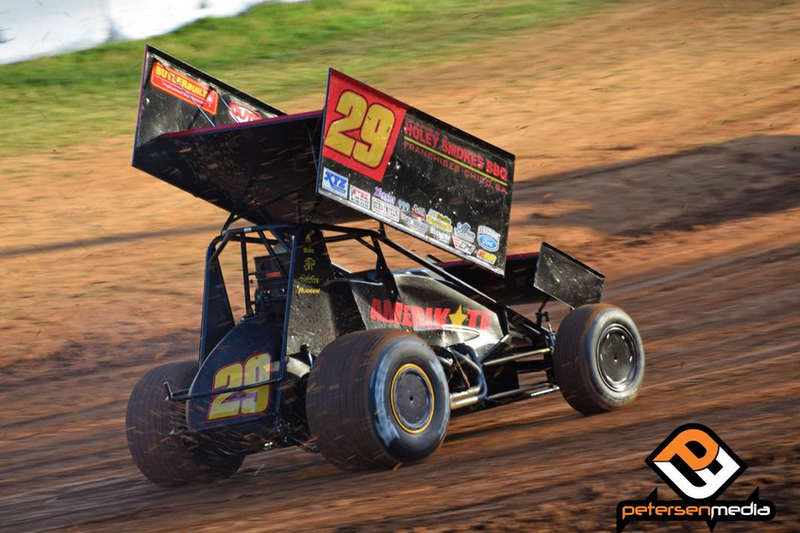 PETERSEN MEDIA- This Friday and Saturday night, the World of Outlaws NOS Energy Drink Sprint Car Series invades the Silver Dollar Speedway in Chico, CA and Stockton, CA’s Dirt Track in Stockton and Willie Croft is poised to repeat previous success at both facilities. First up this weekend is the return of the Mini Gold Cup. Last ran as a World of Outlaws NOS Energy Drink Sprint Car Series event back in 2016, the 2017 event was washed out and the event was taken off the schedule in its entirety in 2018. An ode to this September’s Gold Cup Race of Champions, Croft will be in attendance as he looks for his second Mini Gold Cup crown, he picked up his first back in 2004 driving for Main Motorsports. 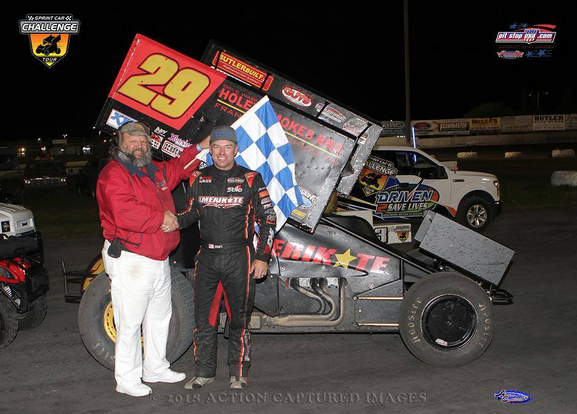 More recently at Silver Dollar Speedway, Croft picked up one of the track’s crowned jewels last May, as he scored the Dave Bradway, Jr Memorial feature event win. As the scene shifts to Stockton, CA on Saturday night, it is another facility that Croft has shined at in recent years. Boasting two career wins at the state’s newest facility, Croft was able to tally a second place run during the 2018 Jimmy Sills Classic and win a lucrative unsanctioned race back in May to headline a handful of strong showings. 2019 BY THE NUMBERS: Races-2, Wins-0, Top 5’s-0, Top 10’s-0. ON TAP: Willie Croft is scheduled to be in action on Friday night at Silver Dollar Speedway in Chico, CA and on Saturday night in Stockton, CA. 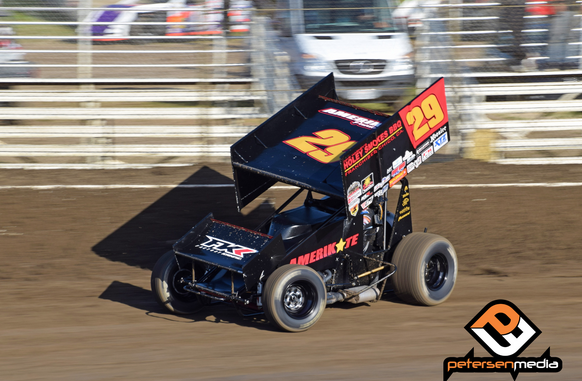 PETERSEN MEDIA- Trophy Cup has been good to Willie Croft since climbing aboard the Rudeen Racing entry a couple years ago. 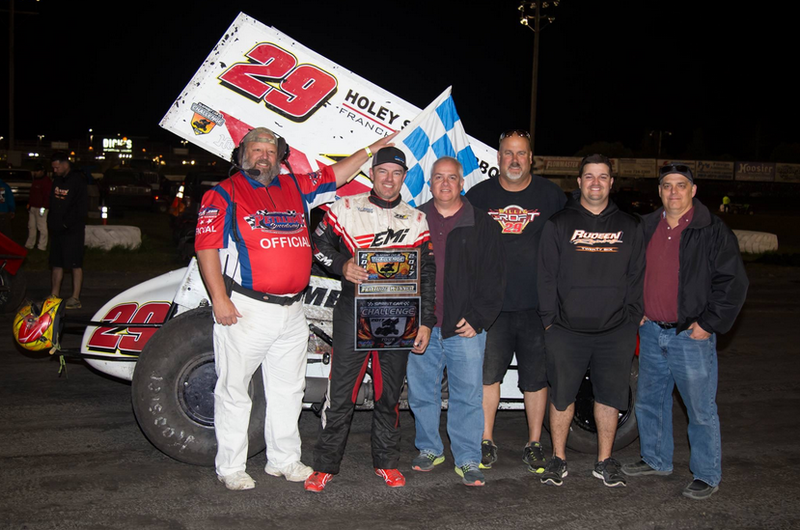 The magic continued during the 25th edition of the event as Croft was dominant during the second half of the Saturday night feature and closed the weekend out fifth in the overall points after winning the feature. Following a tough feature event on Thursday night that saw Croft and team fight a part failure that relegated them to an 18th place finish, though they would have a chance on Friday night to erase that night overall with how the format played out. Friday night would see Croft time the Rudeen Racing machine in third quickest in his qualifying group before advancing from the third row to finish second in his heat race and earn a spot in the feature event. Sitting second in points heading into the feature event, Croft would grid the field from the 11th starting position alongside Gio Scelzi. With the way the track was on this night, wheel-to-wheel action was prevalent but it made working through the field a little more difficult which would not be good for the high point earners. Croft would take the checkered flag with a 12th place finish and found himself 15th in Trophy Cup points heading in the Saturday night finale. Lining up in the third row of his Saturday night heat race, Croft would end up finishing in the eighth position with dropped him back to 19th in Trophy Cup points which would put him on the front row of the feature event as he would simply focus on trying to win the race and see how the points shook out. Lining up on the front row of the feature event alongside 2018 All Star Series Champion, Aaron Reutzel, Croft would settle into second as he chased after the leader. With the opening laps clicking off quickly, drivers would approach the back of the pack which would be a gaggle of really strong cars as the high point earners were fighting to stay on the lead lap. In traffic, Croft would close in on Reutzel and would be right there to capitalize on a mistake as the leader would get into the wall. Taking the top spot, the caution flag would then turn into the open red allowing crews on track to make changes for the second half of the race. Croft would continue to have a strong machine underneath him in the last 25 laps of the feature as he would keep the likes of Colby Copeland and Ryan Bernal at bay as he went on to pick up his seventh feature event win of the 2018 season. 2018 BY THE NUMBERS: Races-62, Wins-7, Top 5’s-20, Top 10’s-26. ON TAP: Willie Croft returns to action on November 3rd in Stockton, CA to take part in the season finales with both the Sprint Car Challenge Tour and the King of the West Series. 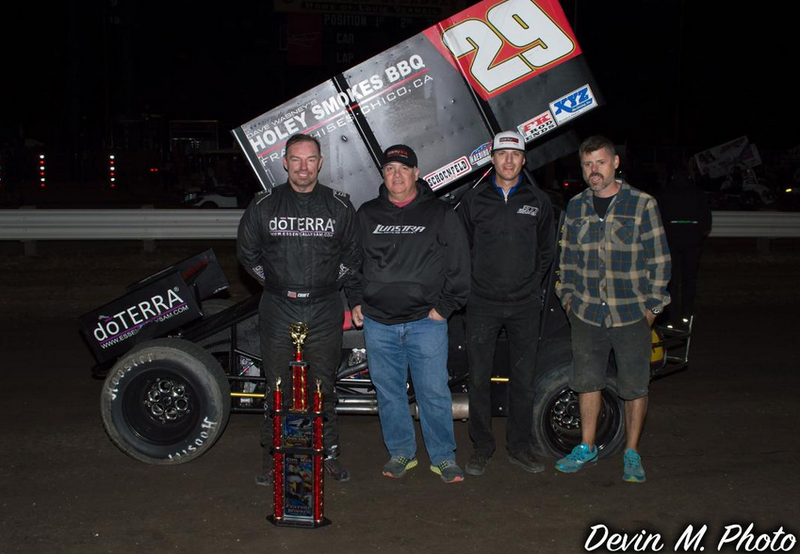 PETERSEN MEDIA- Making his second and final start of the season at Kern County Raceway Park on Saturday night, Willie Croft found himself in the same spot he was back in April; battling with Shane Golobic for the win and ending up with a second place finish. Croft got off to a great start on Saturday night as he timed the Holey Smokes BBQ/ButlerBuilt/Brown and Miller backed No. 29 machine in fastest overall during time trials and found himself in the fourth starting position in heat race competition. Running fourth in his heat, Croft would have enough points to qualify for the Dash where he would take advantage of his front row starting position and pick up the win. By way of winning the Dash, Croft had lane choice for the feature event and with the way the surface was he made the call to start in the outside lane and it would pay off as he got off to the early lead. Looking strong out front as he stayed glued to the cushion, Croft would quickly find the back of the pack and his pace would slow a touch and it would allow Shane Golobic to close in on him. Lap seven saw Croft slide up in front of a slower car, and as he tried to get back to the cushion, Golobic was able to carry more speed and driver past him as Dominic Scelzi and Bud Kaeding took advantage and put Croft back to fourth. Continuing to run well in fourth, Croft would move into second with a few to go as a couple of cars tangled in front of him. The ensuing restart would see Croft take a couple of shots at Golobic for the race lead, but on this night Croft would hang to and collect a second place finish. 2018 BY THE NUMBERS: Races-57, Wins-6, Top 5’s-18, Top 10’s-23. ON TAP: Willie Croft and his team are set for a busy Saturday night where they will be in action with both the King of the West and Sprint Car Challenge Tour at Keller Auto Speedway in Hanford, CA taking part in the Cotton Classic. 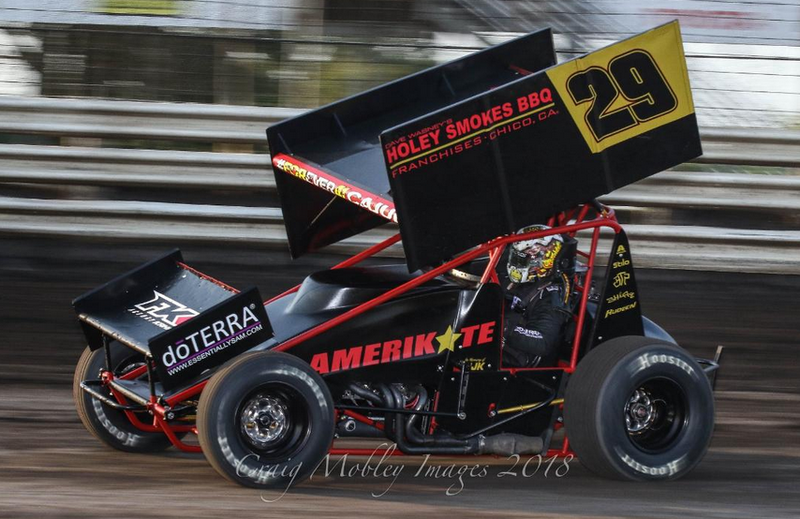 PETERSEN MEDIA- Putting a tough Friday night behind him, Willie Croft and the Willie Croft Racing team would have a strong showing on Saturday night that saw him close his weekend out with a fifth place finish. Saturday night at Placerville Speedway, Croft opened his night up by timing the Holey Smokes BBQ/ButlerBuilt/FK Rod Ends backed No. 29 machine in fastest overall in his qualifying group before finishing second in his heat race. Making his way into the Dash by way of his qualifying effort and his heat result, Croft would finish sixth and take the green flag from the third row to open up the 35-lap finale. Slipping back to 10th in the early goings of Saturday night’s feature event, Croft would soon settle in on the slicked off racing surface as he began carving his way forward and seemingly getting better and better with each passing lap. A lap 15 restart would really see Croft make up some ground as he was able to work his way up to sixth before the caution flew just four laps later on the 19th circuit. The final 16 laps saw Croft battle with the likes of Mitchell Faccinto and Kyle Hirst for position as Croft would close his weekend out with a fifth place finish just one night after a tough 15th place finish. 2018 BY THE NUMBERS: Races-54, Wins-6, Top 5’s-17, Top 10’s-21. ON TAP: Willie Croft returns to action for another busy two-race weekend as he will be in Chico, CA for the Fall Nationals on Friday and Saturday night. 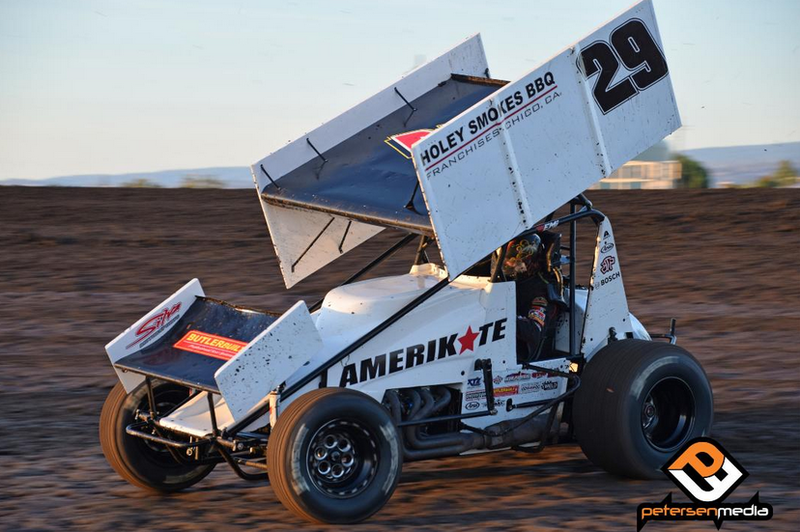 PETERSEN MEDIA- Another busy week of racing action for Willie Croft and the Willie Croft Racing team was highlighted by a dominant win on Saturday night at Calistoga Speedway with the Civil War Series. 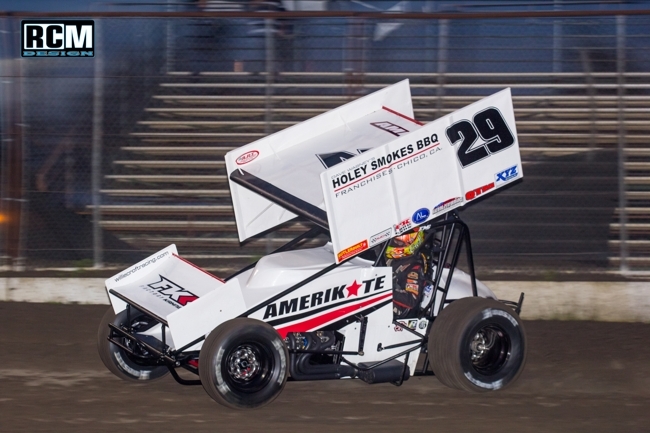 Doing double duty on Saturday night as he was also in action with the World of Outlaws, Croft kicked the Civil War Series program off by turning in the second fastest lap in qualifying time trials, before racing to a heat race win. Finishing second in the Dash, Croft would start alongside new series champ, Cole Macedo, for the 20-lap feature event. Once he cleared Macedo in turns one and two, Croft was off to the races. Simply dominating the feature event, Croft would easily pick up his sixth win of the season as he parked in victory lane at the historic speedway. During the World of Outlaws portion of the night, Croft would time the Holey Smokes BBQ/ButlerBuilt/Brown and Miller backed machine in 11th fastest in time trials before finishing fourth in his heat race. Lining up 11th to start the feature event, Croft would find himself in torrid battles with the likes of Ian Madsen and Shane Golobic as the fought to get a spot inside the Top-10. Slipping back a position as the rubber began to go down on the Speedway, Croft would take the checkered flag in 13th, which was a nice way to cap the World of Outlaws swing after being involved in a lap three crash on Friday night, and pulling off at the start of the feature at Placerville Speedway on Wednesday night. 2018 BY THE NUMBERS: Races-52, Wins-6, Top 5’s-16, Top 10’s-20. ON TAP: Willie Croft and company will be in action this Friday and Saturday night at Placerville Speedway in Placerville, CA. 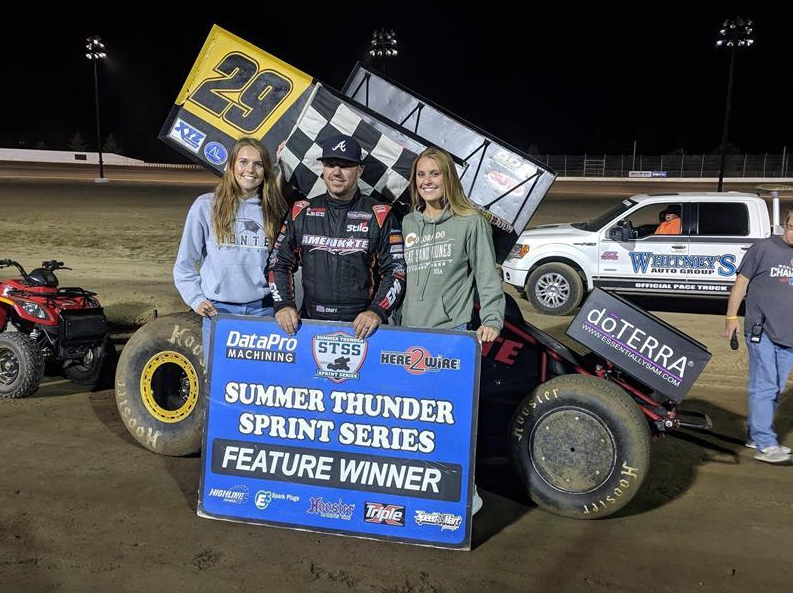 Willie Croft and his team opened September by competing seven times in nine nights in three different states and were able to score a win last Sunday night in Elma, WA with the Summer Thunder Sprint Car Series. Following a couple of hard fought nights at Skagit Speedway with the World of Outlaws that saw Croft finish 14th and 17th aboard the Holey Smokes BBQ/ButlerBuilt/Brown and Miller entry, the team checked in at Gray’s Harbor Raceway on Sunday night. Timing in eighth quickest in qualifying time trials, the Roseville, CA driver would race his way to a third place finish in his heat race which ultimately saw him grid the field from the third row. On racy surface, Croft would work his way up into second where he would start to challenge race leader, Jared Peterson. A couple of Croft’s bids for the lead would be countered, but on the 21st lap ‘Double Down’ made the move of the night and he would go on to claim his fifth win of the 2018 season. Running the next night with the World of Outlaws at Gray’s Harbor Raceway, Croft would like to build off of the momentum from the win as he timed in 8th quickest in time trials and ran fourth in his heat race. Working his way forward in the early stages of the race, Croft would run inside the Top-10 until a restart dropped him back to 13th. Continuing to fight Croft would get back up to 10th with just four laps to go but would end up 15th at the stripe. 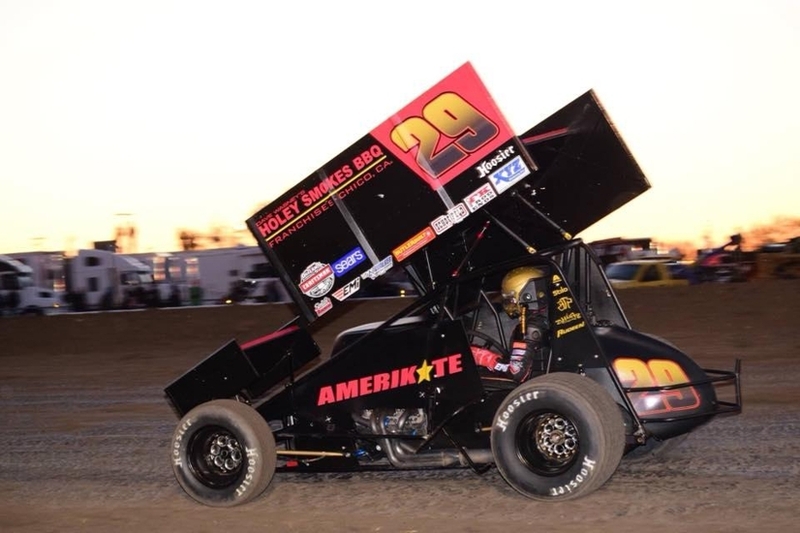 A tough night in Oregon on Wednesday night saw Croft finish 20th as he made his way back into his native California for the Gold Cup Race of Champions on Friday and Saturday night in Chico, CA. Getting off the racing surface while maneuvering on a thick cushion in heat race action on Friday night, Croft would vie for a transfer position in the Last Chance Showdown only to come up short and not make the feature. Saturday night’s finale saw Croft time in 17th quickest in time trials before a late move on a restart in his heat race saw him jump into the fifth and final transfer position where he would earn a berth into the 40-lap Gold Cup Race of Champions feature event. Rolling off the starting grid from the 17th starting position, Croft would look very good in the opening stages of the race as he would work up as high as 13th and look for a spot in the Top-10. With a car losing the handle in front of him on the seventh lap, Croft would be forced off the racing surface as he would slip back to 25th and have his work cut out for him. Though he would have a very fast racecar underneath him, being back deep in the field on the ¼ mile would see him go a lap down early. Still putting it all out there, Croft would close his Gold Cup with a 23rd place finish. 2018 BY THE NUMBERS: Races-48, Wins-5, Top 5’s-15, Top 10’s-19. ON TAP: Willie Croft is set for Placerville Speedway on Wednesday night and Calistoga Speedway this Friday and Saturday. Taking part in one of the biggest 10-day stretches of racing in the world, Willie Croft has concluded his trip to the Midwest after taking part in the 360 Nationals, the Ultimate Challenge, and the 58th Annual Knoxville Nationals and now readies for the World of Outlaws Fall Midwest swing. 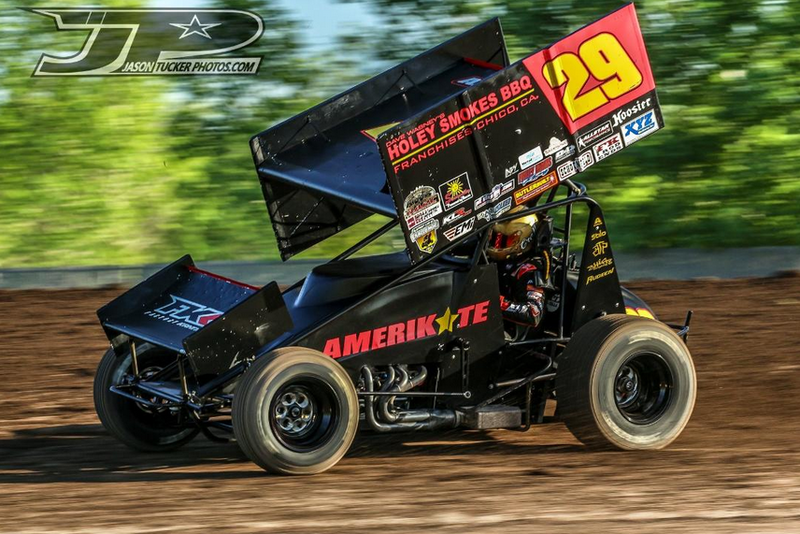 Making his way back to the Midwest for a trio of All Star Races over the weekend to get his feet, Willie Croft now eyes the Knoxville 360 Nationals and is set for his qualifying night tomorrow when the curtain goes up on the annual event. 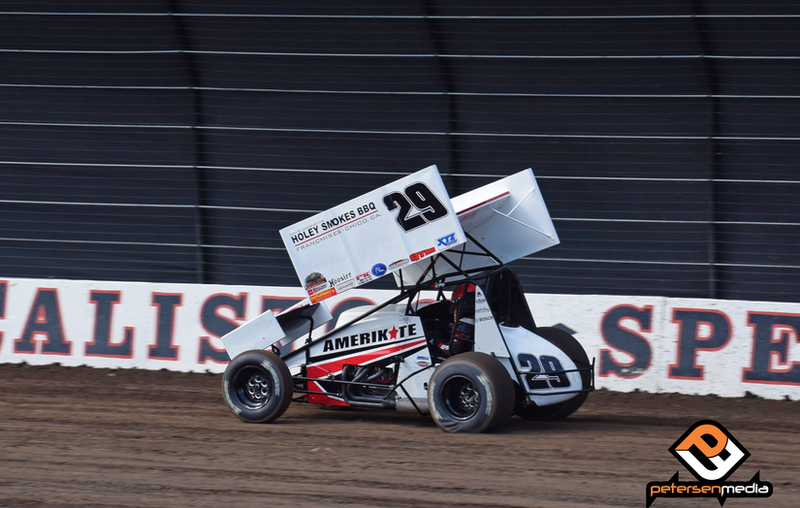 Taking part in racing action at Jackson Motorplex, Knoxville Raceway, and 34 Raceway, Croft was able to race his way into two feature events against some stiff competition. Finishing 21st to open his trip up at Jackson Motorplex, Croft would then go to war with a stiff 56 car field at Knoxville Raceway where he would finish 14th in the ‘B’ Main, before capping his weekend with a 17th place finish at 34 Raceway in Burlington, IA. With a chance to get three races under his belt back in the Midwest, Croft is now ready to take his crack at the 360 Nationals aboard the Holey Smokes BBQ/ButlerBuilt/Brown and Miller backed No. 29 entry. 2018 BY THE NUMBERS: Races-34, Wins-4, Top 5’s-13, Top 10’s-17. ON TAP: Willie Croft will hit Knoxville Raceway on Thursday night for his 360 Nationals preliminary night before returning to action on Saturday night for the Championship finale. 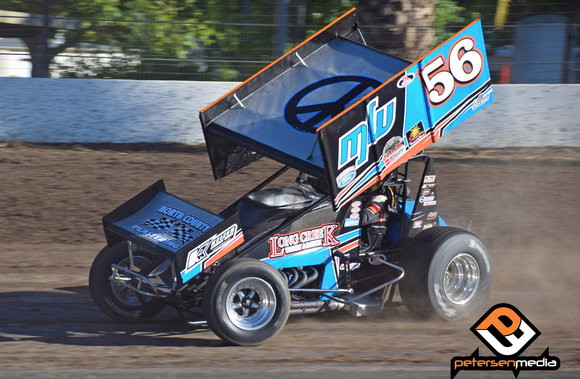 Following a fifth place finish with the Sprint Car Challenge Tour on Saturday night in Stockton, CA, Willie Croft and his Willie Croft Racing team made the trip North for the opening legs of Speedweek Northwest where Croft would grab the win during opening night at Coos Bay. Croft kicked Speedweek Northwest off on Tuesday night by timing the Holy Smokes BBQ/ButlerBuilt/Brown and Miller backed No. 29 machine in fourth fastest in qualifying time trials. Finishing third in heat race competition, Croft would move into the Dash where he would pick up the win and find himself on the pole for the 30-lap Speedweek Northwest opening night feature event. When the race came to life, Croft was shot out of a cannon as he jumped to the early lead and had full control of the feature event. Finding traffic early, Croft continued to flex his muscle as the only thing that seemed to slow him on this night were yellow flags. Nailing each and every restart, Croft was able to race his way to his fourth win of the season and his first career Speedweek Northwest triumph. Prior to making the trip up North, Croft and company battled with the Sprint Car Challenge Tour in Stockton, CA on Saturday night. Earning quick time honors on the slick Stockton Dirt Track surface, Croft would finish fourth in his heat race and used his qualifying time to earn a spot in the Dash. On an extremely slick surface in the Dash, Croft’s six place finish lined him up in the third row of the feature event. Following a complete re work prior to the feature event, Croft would battle inside the Top-Five when the action came to life. In a hard fought, gritty effort, Croft would grab a fifth place finish when the checkered flag flew on the Tribute to LeRoy Van Connett. 2018 BY THE NUMBERS: Races-29, Wins-4, Top 5’s-12, Top 10’s-16. ON TAP: Willie Croft will return to action tonight in Lebanon, OR. 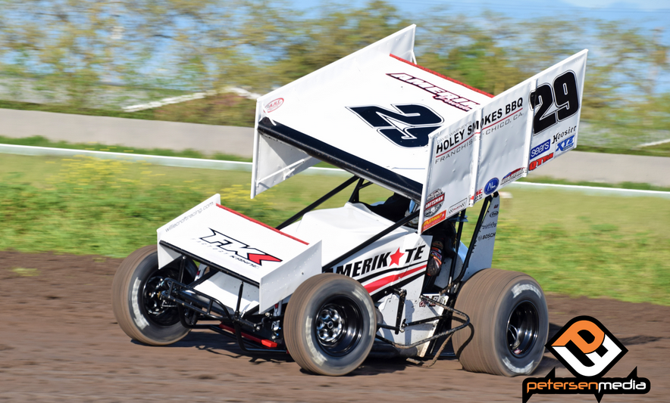 PETERSEN MEDIA- Competing with both the King of the West Series and the Civil War Series on Saturday night in Calistoga, CA, Willie Croft would pick up second a fourth place finishes respectively. In King of the West action, Croft timed the Holey Smokes BBQ/ButlerBuilt/Brown and Miller backed No. 29 entry in with the quickest lap in qualifying time trials, putting him in the second row of his heat race. Jumping into third when his heat race came to life, Croft would hold down the show position, as he would punch his ticket into the Dash by doing so. Finishing second in the Dash, Croft would grid the field from the front row for the 25-lap feature event as he started alongside Shane Golobic. Falling into second when the race came to life, Croft would soon battle for the spot with Kyle Hirst as he found himself in third when the first caution flew on the sixth lap. The restart would see Croft drift up the track in turns one and two and allow Matt Dumesny to sneak past him as he found himself in fourth. Continuing to run fourth, the final restart would come following a lap 14 caution and it would put the lead pack bumper to bumper. Battling with Dumesny in the closing laps, Croft would be unable to steal the final spot on the podium as he took the checkered flag with a fourth place finish. In Civil War action, Croft was the hired gun for the potent Mike Phulps No. 56 machine. Timing in 11th fastest in time trials, Croft would find himself on the front row of his heat race. Taking advantage of the starting spot, Croft would adapt well to the Phulps entry as he would win the heat and go on to win the Dash. Leading the field to green for the 25-lap Civil War Series feature event, Croft would run in the second spot early in the race as he chased after Colby Copeland. Getting into traffic around the race’s halfway point, Croft would sit in the cat bird’s and pounce on Copeland in traffic and take the race lead on the 15th circuit. Out in front, Croft would take a liking to the high side of the speedway as he opened up a lead on the field until the caution flew on lap 19 and bunched everyone back up. While running out front, Croft would jump back up top, but second running Copeland would dive low and make it stick and grab the race lead. Unable to get back by, Croft would take the checkered flag with a second place finish. 2018 BY THE NUMBERS: Races-24, Wins-3, Top 5’s-10, Top 10’s-14. 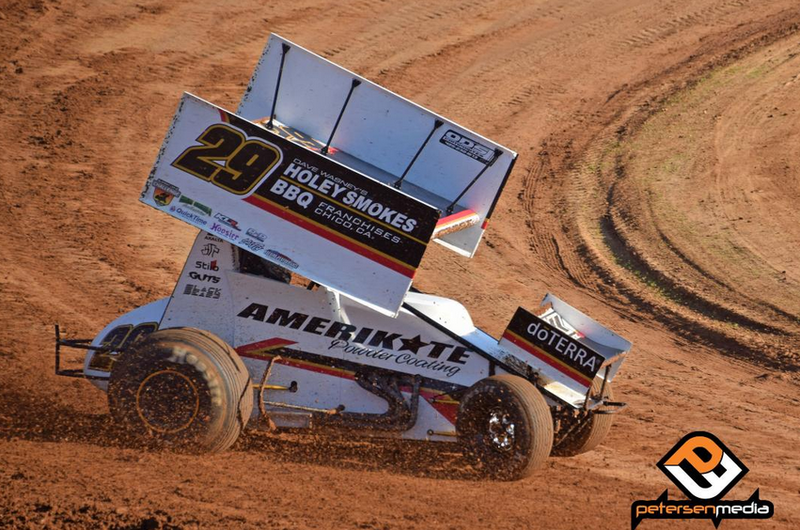 ON TAP: Willie Croft will again do double duty this weekend, as he will be at Placerville Speedway with the King of the West Series and the Sprint Car Challenge Tour. PETERSEN MEDIA- Saturday night in Petaluma, CA, Willie Croft looked extremely strong as he led the early laps of the feature event. Taking evasive action and spinning to a stop in traffic on the 10th lap, Croft would rally from the back of the pack and salvage his night with an eighth place finish. Croft would look for his second win of the season at the bullring in the Bay on Saturday night as he kicked things off by timing the Holey Smokes BBQ/ButlerBuilt/Brown and Miller backed No. 29 machine in sixth quickest in qualifying time trials. Finishing second in his heat race, the Roseville, CA driver would tally enough points to earn a berth in the Dash where the one pill put him on the front row and in prime position to earn a great starting spot for the feature event. Picking up the win, Croft would find himself on the pole for the 30-lap ‘A’ Main alongside Brother-in-law, Kyle Hirst. Leading the field to green, Croft would be shot out of a cannon when the action came to life and would quickly distance himself from the rest of the field. Out in control early, Croft would soon find himself in traffic where the action would pick up. Keeping the field at bay for the first 10-laps, trouble would soon find Croft as he would take evasive action while closing in on a slower car and it would result in him spinning to a stop in turn four. Relinquishing the lead, Croft would be mired deep in the field as he would be forced to the back of the pack. Still with a strong car underneath him, Croft would put forth a valiant effort of charging his way back forward on the Petaluma gumbo, as he would work his way back into the Top-10. In the closing laps, Croft would move into eighth where he would take the checkered flag. 2018 BY THE NUMBERS: Races-19, Wins-3, Top 5’s-8, Top 10’s-12. ON TAP: Willie Croft is scheduled to return to racing action Friday night in Chico, CA and on Saturday night at Keller Auto Speedway in Hanford, CA. 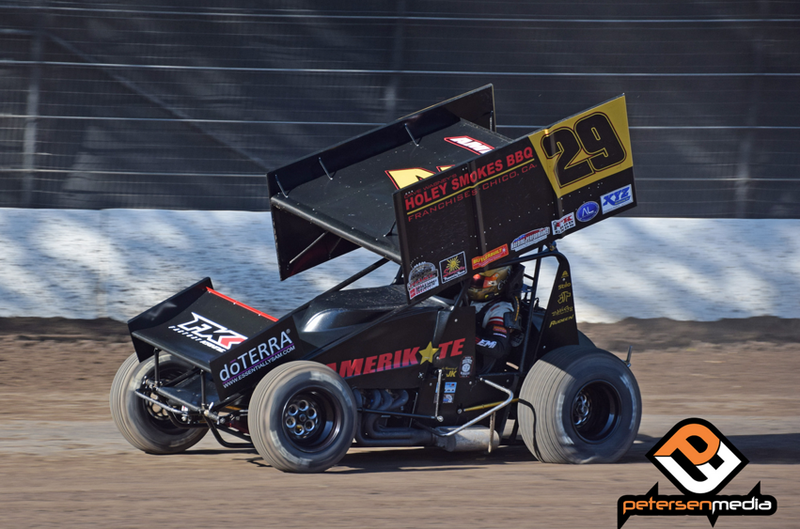 PETERSEN MEDIA- Coming off of a big win at Stockton Dirt Track a week ago, Willie Croft returned to action with the King of the West Series where a late race restart would propel him to a fourth place finish at the Chris and Brian Faria Memorial. Timing the Holey Smokes BBQ/Butlerbuilt/Brown and Miller No. 29 machine in third fastest in qualifications, the Roseville, CA pilot worked his way to a third place finish during heat race competition. Acquiring enough points via time trials and his heat, Croft would find himself in the six-car Dash where a fifth place finish placed in in the third row of the 30-lap feature event. With the preferred groove on this night right up on the fence, Croft would find himself racing in fifth and sixth much of the night as passing would prove to be challenging on this night, especially with no traffic in play. Turning in some very strong laps on the cushion, a late restart would bunch the field up and give drivers one final shot to make up some ground. When the green lights turned back on, some drivers would dive low looking to move up but Croft would stay committed to the cushion. Able to get a position late, Croft would take the checkered flag with his eighth top-five finish of the season by way of a fourth place finish. 2018 BY THE NUMBERS: Races-18, Wins-3, Top 5’s-8, Top 10’s-11. ON TAP: Willie Croft will follow the King of the West Series to Petaluma Speedway on Saturday night. PETERSEN MEDIA- Saturday night in Stockton, CA, Willie Croft would grab the headlines as he took command of the feature event early and went on to earn his third win of the season and take home the cool $5,000 that was offered up. With 18 cars on hand for the unsanctioned event on the San Joaquin County Fairgrounds, Croft would open Saturday night up by timing the Holey Smokes BBQ/ButlerBuilt/Factory Kahne backed No. 29 entry in third quickest in qualifying time trials. Lining up in the second row of his heat race, the Roseville, CA driver would race his way to a second place finish which would be good enough to lock him into the evening’s Dash. The three-pill lined Croft up in the second row of the Dash where a third place finish would then put him in the second row of the 30-lap feature event. The start of the feature got a little tense with a car in front of the field getting out of shape, but Croft would avoid all contact and live to see the second restart. Jumping into second when the race came alive, Croft would chase after DJ Netto who ran just ahead of him. Able to get by Netto in the early laps of the feature event, Croft would then begin finding some patchy rubber that began going down on the speedway. Hitting his marks, Croft would do a great job of keeping Netto, Hirst, and Shane Golobic at bay as he worked the tricky Stockton Dirt Track racing surface. When the checkered flag was displayed to the field, Croft got to it first and enjoyed the spoils of victory lane with his Willie Croft Racing team. “I have to thank everyone who continues to support this team, and I have to thank the team at Stockton for giving us a place to race,” Croft added. 2018 BY THE NUMBERS: Races-17, Wins-3, Top 5’s-7, Top 10’s-10. ON TAP: Willie Croft is now scheduled to travel to Tulare, CA on Saturday night to take on the King of the West Series during their final visit of the season to Thunderbowl Raceway. 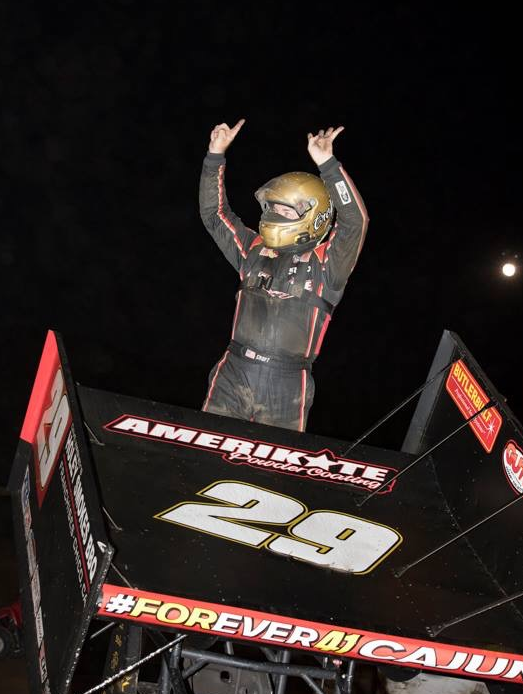 PETERSEN MEDIA- One week after coming oh-so-close to a win on a pair of occasions, Willie Croft was able to make a last lap pass on Tim Kaeding Saturday night at Petaluma Speedway and score his first win of the season as he topped the loaded Sprint Car Challenge Tour field. Saturday night in Petaluma, CA Willie Croft opened his night up by timing the Holey Smokes BBQ/ButlerBuilt/Brown and Miller backed No. 29 machine in quickest overall in his qualifying group which would line him up in the second row of his heat race. In a spirited battle with Tim Kaeding, Colby Copeland, and Justin Sanders in heat race action, Croft would pocket a third place finish and make his way into the all important Dash which would set the field for the 35-lap feature event. Winning the Dash, Croft would find himself on the front row of the ‘A’ Main, and would jump out to the early lead. Out front, Croft would leave the field in his wake though he would soon find lapped traffic in his crosshairs. Battling with Tim Kaeding and Shane Golobic amidst a myriad of other cars, Croft would fall back as far as the third position on the 20th lap. A late restart would see Croft reclaim the second position and he would continue to stalk Kaeding as the leaders again found traffic with just a handful of laps left in the feature event. 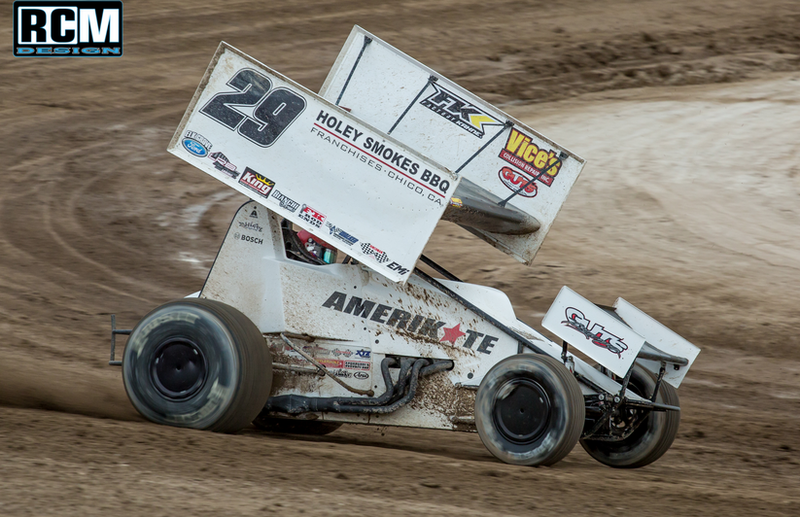 With the white flag in the air, Croft would close in on Kaeding and the duo would race side by side out of turn two with dense traffic in front of them. Charging into turn three Kaeding would go high and Croft would go low and Croft would make it work as he came around to beat Kaeding to the line and claim an exciting feature event win. With the win, Croft now finds himself atop the SCCT standings. 2018 BY THE NUMBERS: Races-12, Wins-1, Top 5’s-4, Top 10’s-6. ON TAP: Willie Croft will be in Chico, CA this Friday and Saturday night as he will take part in the Bill Brownell Memorial as well as the Dave Bradway, Jr Memorial. Willie Croft had one of those weekends that leaves a bittersweet taste in your mouth. Leading laps and battling for the win both Friday and Saturday night, a little bad luck would keep him enjoying good finishes. Battling with the King of the West Series on Friday night at Ocean Speedway, Croft opened his busy weekend up by timing the Holey Smokes BBQ/ButlerBuilt/Brown and Miller backed No. 29 machine in 10th quickest in time trials. Lining up on the front row of his heat race, the Roseville, CA driver would take care of business and pick up the win which would give him enough points to move into the Dash. Making some big moves in the Dash, Croft would work his way up to a second place finish, which put him on the front row for the 30-lap feature event. From his front row starting position, Croft would be shot out of a cannon as he quickly opened up a sizeable lead on the field. Putting his potent No. 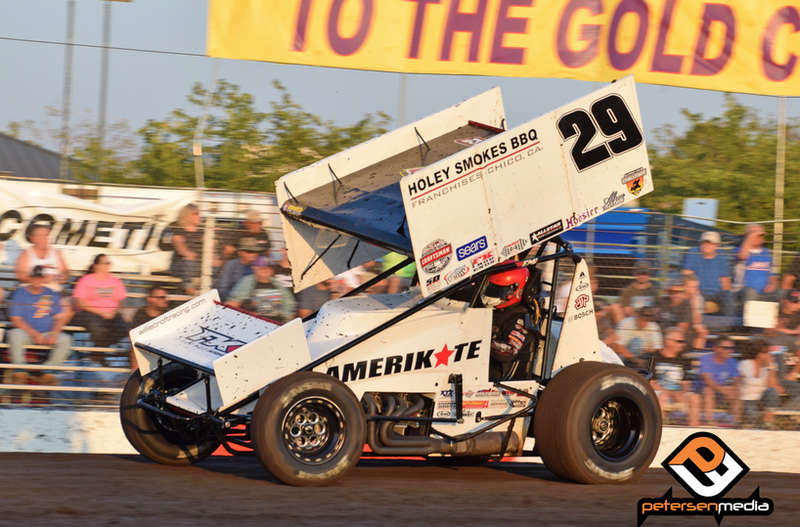 29 entry anywhere he needed to, Croft would quickly find lapped traffic and would a great job of cutting through it as he kept Kyle Hirst and Tanner Thorson at arms reach. Enduring a couple of restarts, Croft would continue to flex his muscle and lead the way until a late caution shook things up. A lap 25 restart would see Croft have company in the name of Kyle Hirst. With Hirst battling for the top spot, Croft would feel his right rear begin to go down as it changed the handling of his car. A yellow on lap 27 would see Croft do what he could to keep pressure up, but when the race came back to life it was apparent he would be unable to hang on and he would do a great job of getting out of harms way and getting back to the pits. Disappointed with the result, Croft and the Willie Croft Racing team would flush the night, and travel to Stockton, CA on Saturday night to take part in the Asparagus Cup. Getting off to a great start during the inaugural event, Croft would show serious speed early as he earned quick time honors on this night. From the second row of his heat race, Croft would pick up a second place finish and move into the Dash where a second place finish would put him on the front row of the $10,000-to-win, 30-lap feature event. When the race came to life Croft would settle into second as he chased after Gio Scelzi for the first eight laps of the race. Taking advantage of a lap nine restart, Croft would get the better of the youngster and charge ahead to the race lead. On a slick racing surface, Croft would look extremely strong out front as he would soon find the back of the pack in front of him. Getting into traffic, and hard charging James McFadden would close in on croft and the two would begin to duel for the top-spot. Battling neck and neck with the Australian stand out just past the race’s halfway point, McFadden would nose Croft at the line on the 21st lap. Fighting in traffic, Croft would be forced to take evasive action to avoid contact with another car and it would result in him getting to hard into the cushion and stalling his machine with just nine laps to go. Restarting from 17th , Croft would make a couple of moves in the final laps to take the checkered flag with a 14th place finish. 2018 BY THE NUMBERS: Races-11, Wins-0, Top 5’s-3, Top 10’s-5. ON TAP: Willie Croft is set to take on the Sprint Car Challenge Tour Saturday night in Petaluma, CA. 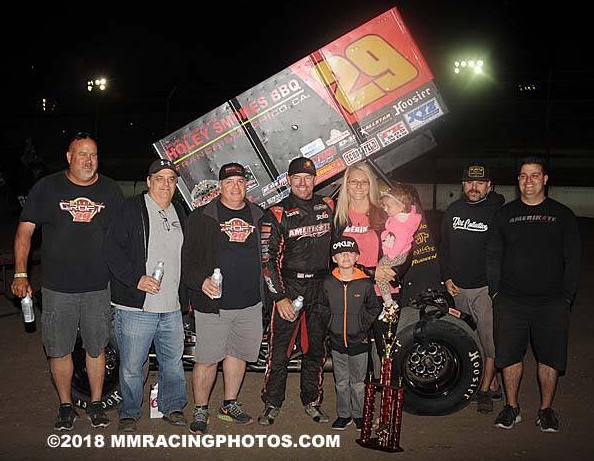 PETERSEN MEDIA- One week removed from a second place run with the King of the West Series, Willie Croft turned in another strong showing on Saturday night that saw him finish second with the Sprint Car Challenge Tour at Stockton Dirt Track during the Jimmy Sills Classic. Saturday night in Stockton, CA Willie Croft opened his night up by timing the Holey Smokes BBQ/ButlerBuilt/Brown and Miller backed No. 29 machine in second quickest overall with 53 cars checking into the pit area. Being the fastest in his qualifying group, “Double Down” would line up in the second row of his heat race and his third place finish would move him safely into the night’s Dash. Scoring a third place finish in the six-lap shootout, Croft would grid the field from the second row for the 30-lap feature event. When the green flag was displayed to the field, Croft would settle into third as he chased after Gio Scelzi and Tim Kaeding who raced in front of him. In a tight pack of cars, Croft would fall as far back as fifth on the fifth lap, but would settle into a nice flow as he surged back to third and now had a pair of Scelzi brothers in his crosshairs. Rolling the bottom in one and two and using the cushion in turns three and four, Croft would close in on the race for the lead, as the Scelzi brothers waged war on each other for the top spot. A late restart would see Croft race past Gio Scelzi to take over the runner-up position as he gave a valiant effort to reel in Dominic Scelzi in the closing laps. Running out of time, Croft would cap his night off with a second consecutive runner up finish. 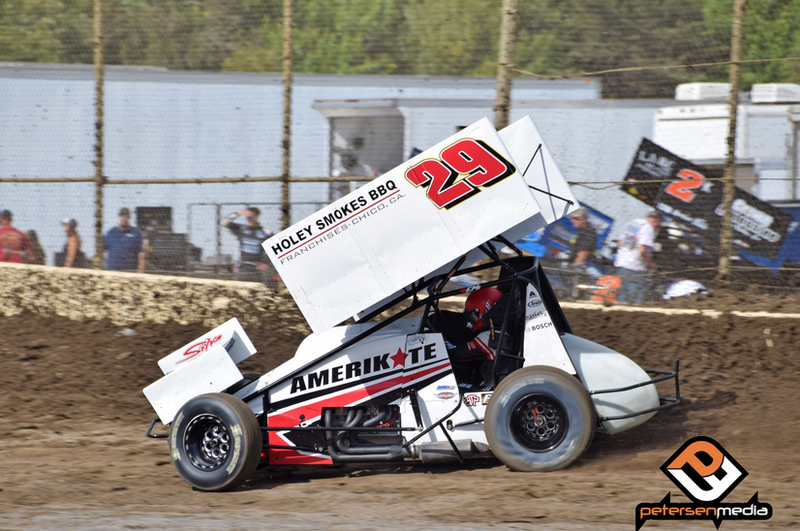 Willie Croft Racing would like to thank Holey Smokes BBQ, ButlerBuilt , Brown and Miller, FK Rod Ends, Hinchman Indy, Factory Kahne, Schoenfeld, Simpson Race Products, Smith Precision Products, Kaeding Performance, AL Drivelines, XYZ, Vortex Wings, Amerikote, and GUTS for their support in 2018. 2018 BY THE NUMBERS: Races-9, Wins-0, Top 5’s-3, Top 10’s-5. ON TAP: Willie Croft will battle with the King of the West Series on Friday night at Ocean Speedway and will then take part in the inaugural Asparagus Cup at Stockton Dirt Track on Saturday night. PETERSEN MEDIA- Sunday night in Bakersfield, CA, Willie Croft got the 2018 King of the West-NARC season kicked off in fine form as he picked up a second place finish in the series’ opening event. A total of 22 cars checked in for the weather-delayed opener as the race was moved back a day to pesky rain on Saturday. Croft opened his night off by timing the Holey Smokes BBQ/ButlerBuilt/Brown and Miller backed No. 29 entry in seventh quickest in qualifying time trials. Lining up on the front row of his heat race, Croft would find himself in a spirited battle with Brother-In-Law, Kyle Hirst. Exchanging the top spot numerous times in the closing laps of the race, Croft would get the better of the deal and grab the win and earn valuable points to propel himself into the Dash. Grabbing the win in the Dash, Croft would put the Hinchman/Factory Kahne Shocks/Schoenfeld backed entry on the pole for the 30-lap feature event. The early start on the rare Sunday event saw the track blow off and go slick early in the program. Track crews would go to work before the feature event and it would present a bit of unknown to the field. When the green flag was displayed to the field, Croft would get the jump initially as he took a liking to the high side of the speedway. Leading the first lap, Shane Golobic would use some grip on the bottom to zip into the lead off of turn two on lap two, and Croft would quickly drop down and shadow the race leader. Following an early stoppage in the race, it was evident the low groove was the place to be on this night and Croft would chase after Golobic as the leaders found traffic. In his pursuit of Golobic, Croft would feel pressure from Dominic Scelzi as the duo hooked up in their own battle for the second spot. Navigating through traffic, the duo would exchange the second position on occasion, with Croft getting the upper hand. Giving chase to Golobic all the way to the finish line, Croft would close his night out with a second place finish. 2018 BY THE NUMBERS: Races-8, Wins-0, Top 5’s-2, Top 10’s-4. ON TAP: Willie Croft will be back in action Saturday night in Stockton, CA as he takes on the SCCT during their second event of the season. 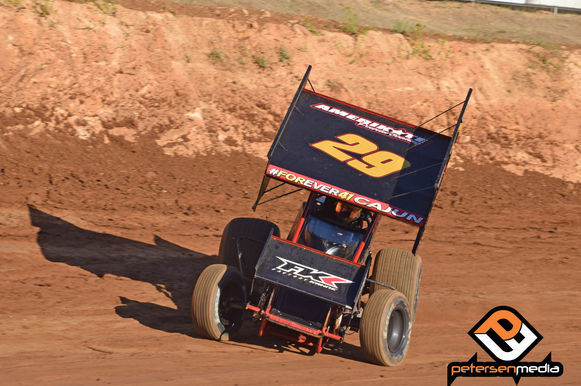 PETERSEN MEDIA- Kicking the Sprint Car Challenge Tour’s second season off on Saturday night in Placerville, CA, Willie Croft turned in a strong showing that saw him pocket a ninth place finish amongst the 46 cars that checked in for the event. ‘These are tough shows, and with the track a little technical all night it was good to get started with a Top-10 with the SCCT, but obviously we want to be up front more battling for the win,” Willie Croft said. In the third qualifying time trials group, Croft got his night started by timing the Holey Smokes BBQ/ButlerBuilt/Brown and Miller backed No. 29 machine in third quickest and found himself on the front row of his heat race. Lining up alongside Mitchell Faccinto in heat race action, Croft would fall back to second but would keep the race leader within striking distance as the win also came with a Dash berth. Unable to find away around Faccinto, Croft’s second place finish would safely put him in the impending 35-lap feature event where he would take the green flag from the 11th starting position. A super fast racing surface in the feature event would prove to be challenging to make up ground on, though Croft was able to do a little moving and shaking as he battled inside the Top-10 for all 35-laps. Working on the tricky cushion that was built up at both ends of the Speedway, Croft was able to work into ninth where he then began to battle Carson Macedo and Andy Forsberg who ran just ahead of him. With all the front-runners laying down quick laps, Croft would be unable to grab anymore positions in the closing laps as he ended his night with a ninth place finish. 2018 BY THE NUMBERS: Races-7, Wins-0, Top 5’s-1, Top 10’s-3. ON TAP: Willie Croft will watch the weather this weekend, but as of now will be in action during the King of the West Series’ opening event on Saturday night at Kern County Raceway Park in Bakersfield, CA. 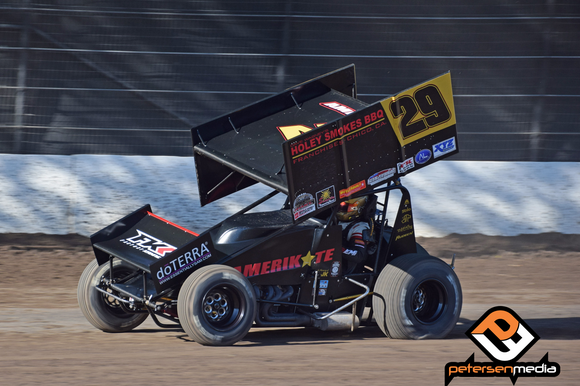 PETERSEN MEDIA- Spending the month of March battling with the World of Outlaws during their Spring West Coast Swing, Willie Croft is primed for some 360ci action this Saturday night as he is set to take part in the Elk Grove Ford Sprint Car Challenge pres. by Abreu Vineyards season opener on Saturday night in Placerville, CA. 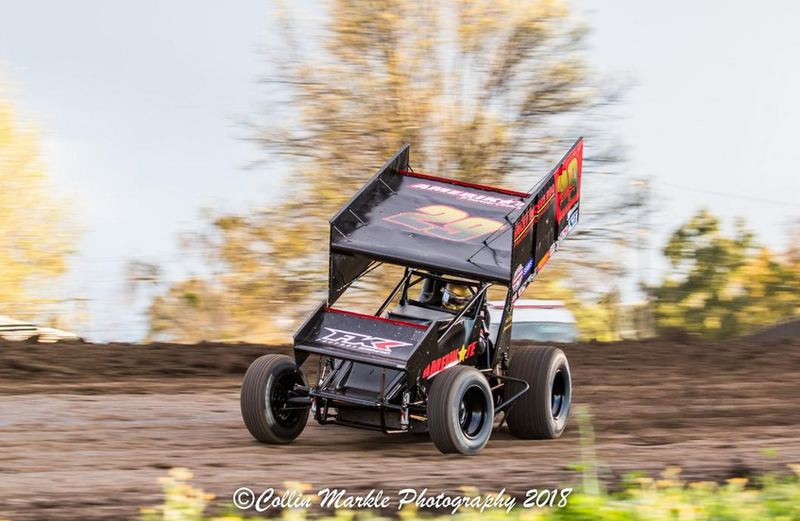 Saturday night saw Croft and his Willie Croft Racing team make the trip to Bakersfield Speedway to take part in the World of Outlaws final start in the Golden State until their return trip later this Fall. Timing the Holey Smokes BBQ/ButlerBuilt/Brown and Miller backed No. 29 machine in 15th quickest amongst the 37 cars checked into the pit area, Croft would find himself in the second row of his heat race. Coming away with a seventh place finish, Croft and company would go to work as they were slated to start on the front row of the night’s Last Chance Showdown. Battling with a couple of familiar foes in Kyle Hirst and Rico Abreu, Croft would give it his all to make his way into the feature event. With the LCS checkered flag in the air, Croft would make a bid for the final transfer position, but he would come up short as a fifth place finish would end his night. 2018 BY THE NUMBERS: Races-6, Wins-0, Top 5’s-1, Top 10’s-2. ON TAP: Willie Croft will be in action on Saturday night in Placerville, CA as he takes part in the 2018 SCCT season opener. PETERSEN MEDIA- Continuing to hold his own and run well with the World of Outlaws Craftsman Sprint Car Series during their Spring Swing out west, Willie Croft would have his best run of the season with the series of the season as he worked his way to a hard fought 10th place finish on Saturday night in Stockton, CA. 39 cars would pack into the Stockton Dirt Track pit area for the series’ lone visit to the facility. Timing in 10th quickest in his time trial group, ‘Double Down’ would line the Holey Smokes BBQ/ButlerBuilt/Brown and Miller backed No. 29 entry up in the third row of his heat race. On a surface that offered up a little of everything on this night following a nasty rain system that pounded the area, Croft was able to get off to a good start in his heat that would result in him finishing fourth and putting him directly into the feature event. Continuing to watch the track and see how it changed prior to the feature on this night, Croft would line the FK Rod Ends/Hinchman Indy/Factory Kahne mount up in the eighth row for the 30-lap finale. An interesting track would greet the drivers on this night, and Croft would adapt well after running in the 15th and 16th spots during the races opening laps. As the race settle din croft would begin working his way forward with the cross flags being shown to the field. Working into 13th, Croft would take over the 12th spot on the race’s 15th circuit. Running 12th for much of the second half of the race, Croft would take advantage of a late restart as he was able to break into the Top-10 as he would cross under the checkered flag with a 10th place finish. 2018 BY THE NUMBERS: Races-5, Wins-0, Top 5’s-1, Top 10’s-2. ON TAP: Willie Croft will follow the World of Outlaws Craftsman Sprint Car Series to Ocean Speedway on Friday night and to Bakersfield Speedway on Saturday. PETERSEN MEDIA- 2018 is off and running for Sacramento, CA driver Willie Croft. 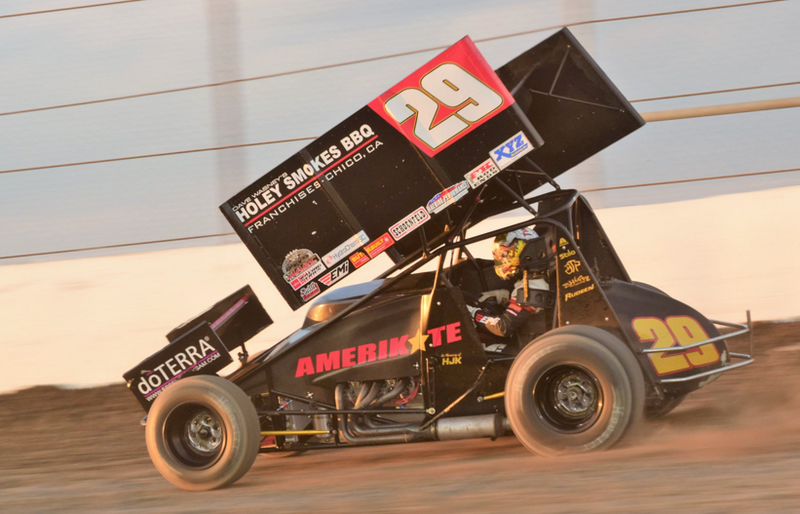 Making the trip to Las Vegas, NV to battle with the World of Outlaws Craftsman Sprint Car Series, Croft would endure a mechanical failure on Wednesday night before finishing 21st on Thursday night. Wednesday night, Croft would get things started by timing the Holey Smokes BBQ/ButlerBuilt/Brown and Miller backed No. 29 machine in 11th quickest in his qualifying flight before finishing fifth in his heat race. Transferring directly into the feature event, Croft would grid the field from the 18th starting position. Turning in some nice laps early in the race, Croft would endure a mechanical failure on the 19th lap and it would bring his first race of the year to an early end. Back to it on Thursday night, Croft would time in 12th quickest on this night before working his way from sixth to fourth in his heat race and again punching his ticket directly into the 30-lap feature event. Lining up in the eighth row on this night, Croft would battle with drivers like Daryn Pittman, Cory Eliason, and Kraig Kinser as they jockeyed for position on the slick ½ mile. Not picking up the result he was hoping for, Croft would close out his two nights in Sin City with a 21st place finish. 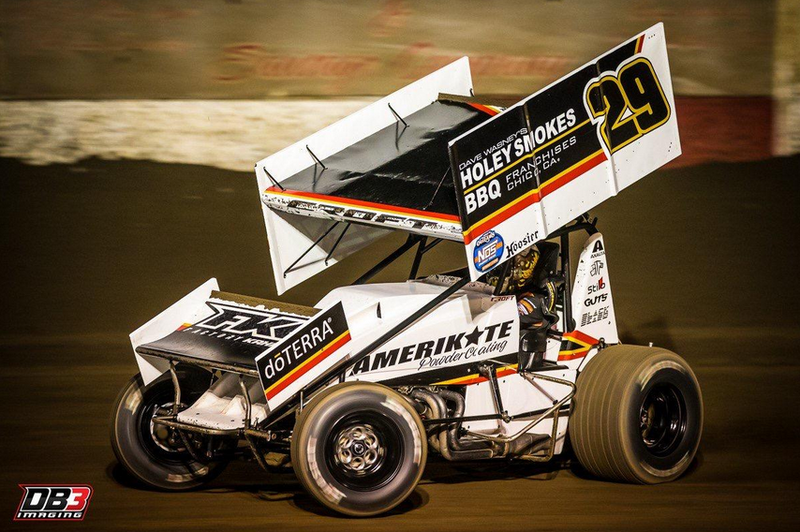 Willie Croft Racing would like to thank Holey Smokes BBQ, ButlerBuilt , Brown and Miller, FK Rod Ends, Hinchman Indy, Factory Kahne, Schoenfeld, Simpson Race Prodcuts, Smith Precision Products, Kaeding Performance, AL Drivelines, XYZ, Vortex Wings, Amerikote, and GUTS for their support in 2018. 2018 BY THE NUMBERS: Races-2, Wins-0, Top 5’s-0, Top 10’s-0. ON TAP: Willie Croft will be back in action with the World of Outlaws Craftsman Sprint Car Series Friday and Saturday in Tulare, CA. Sneaking in one more weekend of racing in 2017, Willie Croft made the trip to Arizona Speedway for the 2nd Annual Copper Classic. Finishing sixth in the Friday night feature event, Croft would have a great night going on Saturday night before a flat right rear tire late in the race knocked him out of the second spot. 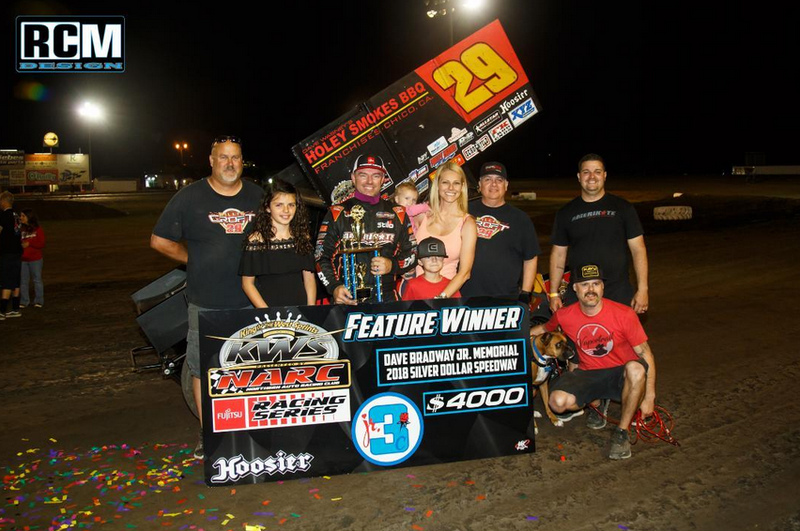 The two-night Copper Classic kicked off on Friday night, and Croft got his weekend underway by timing the Holey Smokes BBQ/ButlerBuilt/Brown and Miller backed No. 29 machine timed in fifth quickest in qualifying time trials. Picking up a fourth place finish during his heat race, the Roseville, CA resident would move directly into the 25-lap feature event where he would take the green flag from the 14th starting position. On the racy Arizona Speedway, Croft showed speed aboard his immaculate black No. 29 machine. Able to search around the speedway during the 25-lap affair, Croft would come away with an extremely strong charge that saw him finish in the sixth position. 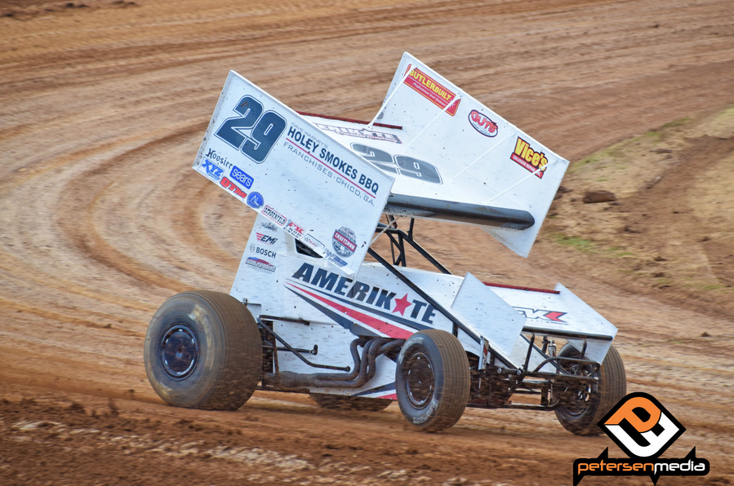 Saturday night saw Croft continue to show speed with the ASCS Southwest Series as he established a new Arizona Speedway track record during qualifying time trials. Racing to a heat race win, Croft would move into the Copper Classic feature event where he would line up in the second row. Jumping up to second when the green flag dropped, Croft challenged early leader DJ Netto during the opening two laps before setting into second on the extremely slick racing surface. Getting into traffic early, Croft continued to stick to the cushion as he kept Netto in his crosshairs. As Netto was able to pull away, Croft would soon find himself in a battle for second with Justin Sanders. With Sanders able to get the spot, Croft would come right back and take over and pull away as the first 21-laps went caution free. Following a restart on the 21st lap, Croft would experience misfortune as his right-rear would pop on the exit of turn two, and his strong showing at the Copper Classic would come to an end. Willie Croft Racing would like to thank Holey Smokes BBQ, ButlerBuilt , Brown and Miller, FK Rod Ends, Hinchman Indy, Factory Kahne, Schoenfeld, Smith Precision Products, Kaeding Performance, AL Drivelines, QTM, XYZ, Dan Olson Products, Vortex Wings, Amerikote, and GUTS for their support in 2017. 2017 BY THE NUMBERS: Races-51, Wins-1, Top 5’s-12, Top 10’s-23. ON TAP: Croft’s 2017 season has come to a close. 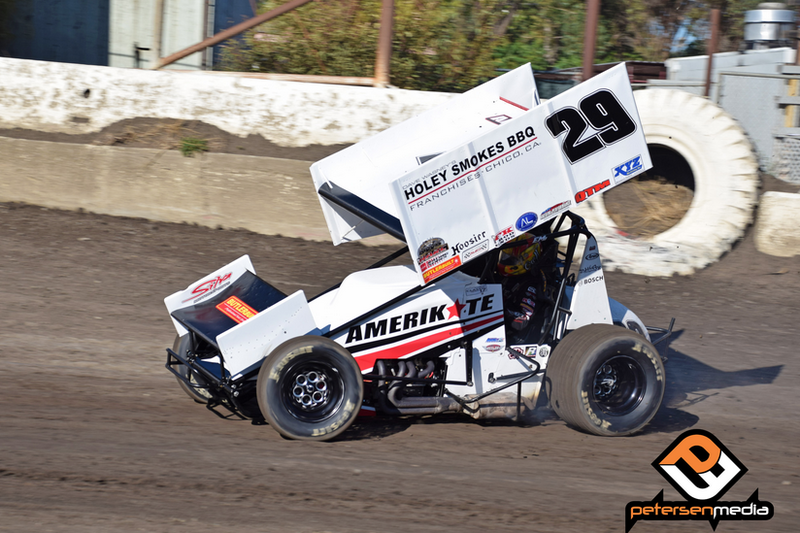 PETERSEN MEDIA- Willie Croft capped a very strong 2017 Sprint Car Challenge Tour season with a fourth place finish at Stockton Dirt Track on Saturday night. With his finish, Croft also solidified a very strong second place finish in the series standings in its inaugural season. 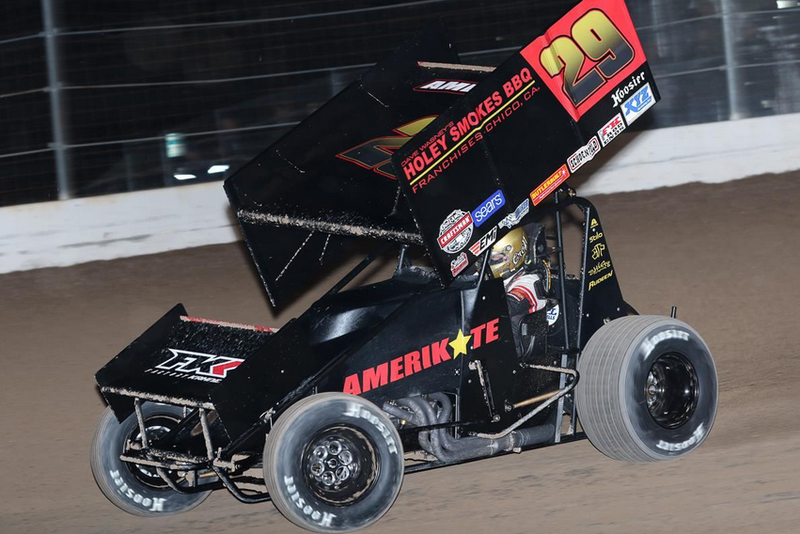 “We would have liked to have been a few spots better on Saturday night, but it was a really tough field of cars, so to come away with a Top-Five and finish second in the final point standings really made for a nice Saturday night,” Willie Croft said. Timing the Holey Smokes BBQ/ButlerBuilt/Brown and Miller backed No. 29 in second fastest overall and second fastest in his qualifying group, Croft would line up in the second row of his heat race. Finishing fourth in his heat, Croft would move directly into the 35-lap feature event, but do to a very good qualifying effort he would also earn a berth into the six-lap dash. Finishing fourth in the Dash, Croft would grid the field from the second row for the final 35-lap SCCT feature event of the 2017 season. On an extremely fast racing surface, Croft would move into third right away as he chased after Cory Eliason and Dominic Scelzi who ran ahead of him. With cars turning in extremely fast lap times, Croft would fall in line as the first 16 laps reeled off in non stop fashion. Once the first caution flew, the flow of the race was slowed drastically and the field would see a handful of double file restarts in the second half of the race. Continuing to run in the lead pack, Croft would see Shane Golobic get by him and put back to fourth briefly before the leader ran into issues on the 18th lap, and Croft moved back up into the third position. As the race moved along, the leaders would find themselves in traffic in the home stretch of the race, and this would allow Kyle Hirst to battle with Croft for the final spot on the podium. In the race’s closing laps, Croft would see his brother-in-law sneak by him and Croft would close his 2017 SCCT campaign with a fourth place finish. 2017 BY THE NUMBERS: Races-49, Wins-1, Top 5’s-12, Top 10’s-22. ON TAP: Croft will take a couple weeks off before bringing his 2017 season to a close at Arizona Speedway for the 2nd Annual Copper Classic November 24th and 25th. 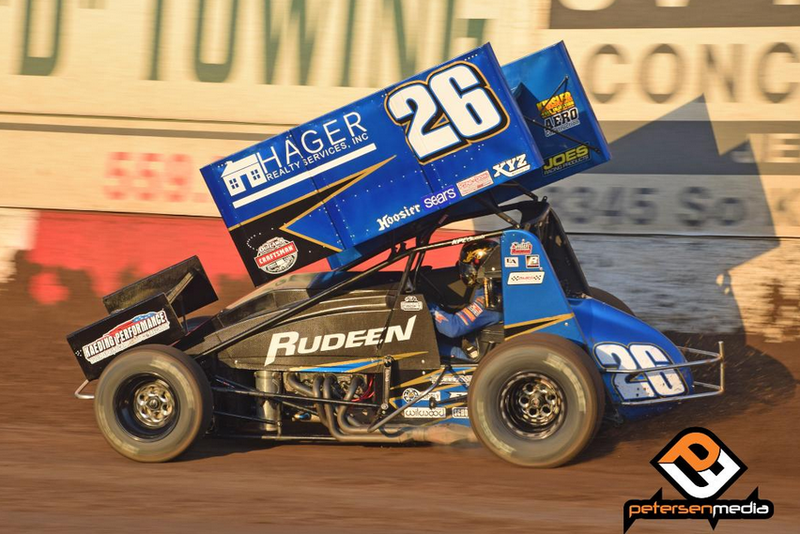 PETERSEN MEDIA- Teaming back up with Rudeen Racing for the 24th Annual Trophy Cup that took place in Tulare, CA, Willie Croft and the team would work all weekend long and end the grueling race second overall in points after a third place finish in the race. 90 cars kicked the weekend off on Thursday night, and Croft would time the famed Rudeen Racing No. 26 machine in 11th quickest during his time trial flight. Lining up in the second row of his heat race, the Roseville, CA driver would finish in the third spot and find himself in one of the twin ‘B’ Main events. Lining up in the fourth starting point of the semi, Croft would waste no time getting to the lead and would then go on to leave the field in his wake. Turning in a dominant performance, Croft would pick up the win and move into the feature event where he lined up 13th, after just narrowly missing out on the front row by way of event points. On a track that gave drivers fits and was demanding, Croft would work his way forward into the Top-10. Working at picking up as many spots as he could to accumulate valuable event points, Croft would close Thursday night out with a ninth place finish, which placed him ninth in points after night one. Looking to better his point total on Friday night, Croft would get off to a very nice start on a track that had a lot more moisture in it as he ended up third quickest in time trials. With the track tough to pass on in heat races, Croft would start and finish sixth which placed him on the pole of a ‘B’ Main. Again picking up the win, Croft would move into the feature event where he would grid the field in the 16th starting spot. On an extremely rough and tumble surface, Croft was able to work through it and work his way forward. Putting his car where he needed to, Croft would advance 10 positions and finish sixth with the 30-lap affair came to a close. Heading into the Saturday night finale, Croft sat 13th in points, though the gap was close through the field. Racing to a fourth place finish in his heat race, Croft would turn into a spectator for the five remaining heats as he waited to see where he ended up heading into the feature event. Moving up to 11th in points, Croft would line up in the 10th starting position for the 50-lap feature event. With the track still fast in the feature, Croft would slowly starting moving forward as the laps clicked off. Battling with the likes of Joey Saldana, Shane Golobic, and Tim Kaeding late in the race, Croft would work his way up to finish third in the race, which put him second on the overall Trophy Cup standings. 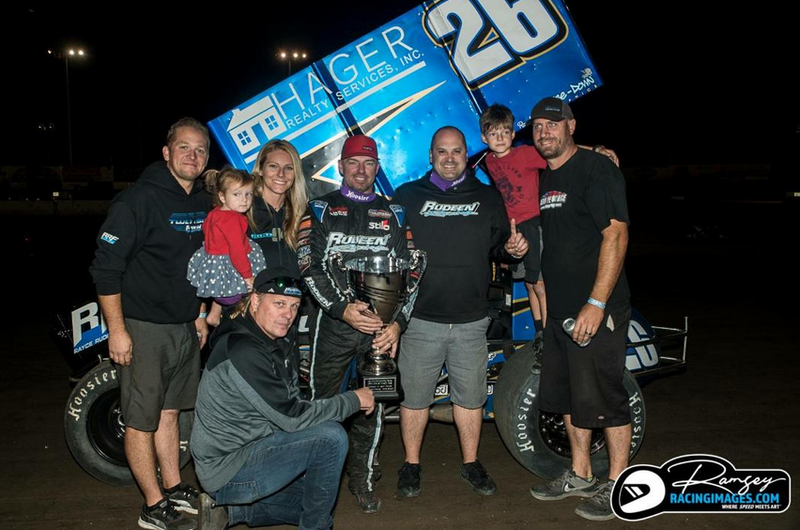 Willie Croft and the Rudeen Racing team would like to thank Kaeding Performance, Brown and Miller, Rod End Supply, XYZ, Firedown Graphics, and Speedmart for their support in 2017. 2016 BY THE NUMBERS: Races-48, Wins-1, Top 5’s-11, Top 10’s-21. ON TAP: Croft will return to action on November 4th at Stockton Dirt Track. Willie Croft looked to be well on his way to the 2017 Short Track Nationals feature event on Saturday night, but a part failure while leading the ‘B’ Main would dash his hopes. “The end result wasn’t what we wanted but it was a really fun trip, and I am thankful to get back and have the opportunity to come at the Short Track Nationals,” Willie Croft said. The three day event kicked off on Thursday night, a night that just did not go in favor of Croft. Starting on the front row his heat race, a questionable start would see him slip back and finish in the fourth spot. Moving into the ‘C’ Main, Croft would take care of business as he picked up the win and moved the Holey Smokes BBQ/ButlerBuilt/Brown and Miller backed No. 29 machine into the back of one of the twin ‘B’s’. Lining up in the eight row of his ‘B’, Croft continued to flex his muscle as he came forward in a hurry. Working into the top-five, Croft would overtake fourth and sat in the catbird’s seat on a final restart. Moving into the third and final transfer spot into the ‘A’ coming to the checkered flag a spinning car in turn two would cause a yellow checkered and they would revert back and Croft would he held out of the feature event. Back in action on Friday night, Croft would line up seventh in his heat race and would make some noise as he carved his way forward to finish fourth. Moving into a qualifier, Croft and Morgan Turpen would put on a memorable show that would see Croft finish in the second position which was good enough to put him in the Friday night feature. Lining up 10th for the 25-lap feature event, Croft would battle the likes of Jonathan Cornell and Brian Bell on the extremely slick racing surface as he fought for position inside the Top-10. Taking the checkered flag in the 11th spot, Croft sat 10th in event points heading into Saturday night’s finale. Finishing sixth in his Saturday night Showdown heat race, Croft would find himself 11th in overall points which placed him on the front row of one of two ‘B’ mains. Getting off to a great start, Croft would power into the lead before heartbreak would hit and a part failure would derail him and end his Short Track Nationals. 2017 BY THE NUMBERS: Races-45, Wins-1, Top 5’s-10, Top 10’s-18. ON TAP: Croft is now slated to pilot the Rudeen Racing No. 26 at the 24th Annual Trophy Cup Thursday-Saturday night in Tulare, CA. Saturday night in Chico, CA, Willie Croft had a really strong racecar in the 40-lap Fall Nationals feature event. The Roseville, CA driver ran in the top-three most of the race but running on a rubber down surface, Croft would lose grip in the final laps and hang on to finish eighth. The 25th Annual Fall Nationals kicked off on Friday night with 57 cars packing into the Silver Dollar Speedway pit area. With qualifying split into two flights, Croft would time the Holey Smokes BBQ/ButlerBuilt/Brown and Miller backed No. 29 in quickest in flight two. Lining up in the second row of his heat race, Croft would do some moving and shaking as he worked his way forward to finish second and earn a spot in the Dash as well as the feature event. Finishing sixth in the Dash, Croft would take the green flag for the 30-lap feature event in the third row. When the race came to life on a very tricky and treacherous surface, Croft would run in the sixth spot during the opening laps as he ran in a tight pack of cars. On the sixth lap, Croft would hit the cushion wrong in turns three and four and it would result in him getting off the racing surface and losing a ton of track position as he slipped back to the 14th spot. Falling back to 20th on a mid-race restart, Croft would pick up a couple of positions in the final 15 laps as he closed his night out with a 17th place finish. Back in action on Saturday night, Croft again got off to a great start as he earned his second quick time award of the weekend and took home $300 courtesy of Man Camp Motorsports. Working his way to a hard fought second place finish in his heat race, Croft would again move into the Dash where a fifth place finish lined him up in the third row of the 40-lap feature event for the second night in a row. On a very slick surface that was also abrasive, Croft would get off to a good start and quickly find himself up in the third spot battling with second running Shane Golobic and fourth running Jonathan Allard. As the laps clicked off, rubber would begin going down on the speedway and tires would become an issue. Working in the rubber, Croft seemed to be faster than Golobic at times but was unable to get by him. In the race’s closing laps Croft’s tires would completely burn up and he would be unable to make grip and held on as long as he could. Slipping out of the groove, he would fall back to finish eighth. 2017 BY THE NUMBERS: Races-42, Wins-1, Top 5’s-10, Top 10’s-18. ON TAP: Croft will be off this weekend due to the fact that his team will begin their trip to Little Rock, AR for the Short Track Nationals taking place at I30 Speedway October 12-14th. 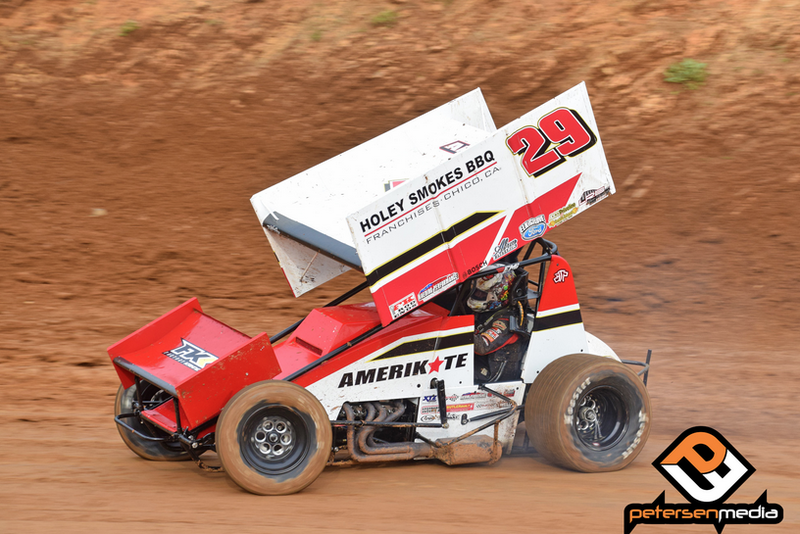 PETERSEN MEDIA- Willie Croft would run well at Placerville Speedway on Friday and Saturday night as he took part in the Nor-Cal Posse Shootout. Finishing fifth on Friday and just missing out on a lock in spot, Croft would end up with an 11th place finish during Saturday night’s finale. With 41 cars checked in for the event, Croft would time the Holey Smokes BBQ/ButlerBuilt/Brown and Miller No. 29 entry in seventh quickest in qualifying time trials. From the second row of his heat race, Croft would pick up the win in a photo finish. Getting his car repaired after getting upside down after the checkered, Croft would make it out for the shuffle where he would fall to Cory Eliason and line up third in the feature event. Running fourth in the early stages of the race, Croft would slip back after a restart and fall as far back as the eighth spot just before the race’s halfway point. Battling with Sean Becker, Dominic Scelzi, and DJ Netto, Croft would look for a lock in position as the end of the race drew to a close. A lap 29 restart would see Croft go for it, but he would end up finishing fifth and be in action for the complete show on Saturday night. Still sitting in a really good spot, Croft would pick up the win from the front row in his first heat before finishing sixth in his second heat race. 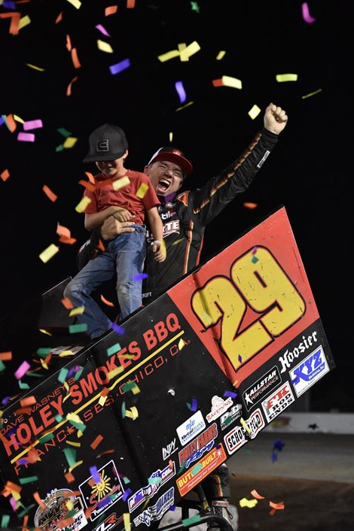 Moving into the shuffle, Croft would defeat Steven Tiner, Dominic Scelzi, and Cole Macedo, before falling to Cory Eliason, which placed him fifth in the starting grid. On the slick Placerville Speedway surface Croft held down the fourth spot for the first part of the race until falling back to fifth on the 11th lap. Looking strong in fifth, Croft ran there until the race’s halfway point when he would slip back a few positions. Falling back to 10th, Croft would battle with Colby Copeland in the final five laps before taking the checkered flag 11th. 2017 BY THE NUMBERS: Races-40, Wins-1, Top 5’s-10, Top 10’s-17. 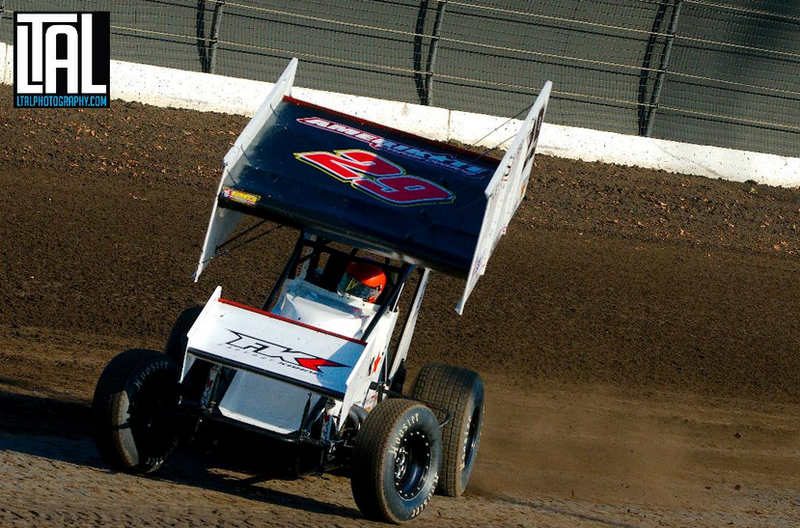 ON TAP: Croft is set for another two-race weekend this Friday and Saturday in Chico, CA as part of the Fall Nationals. 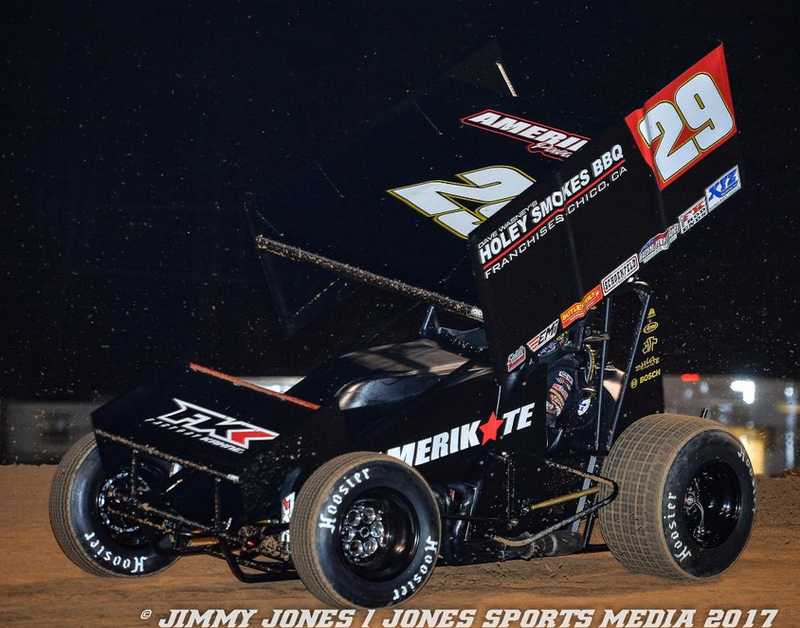 PETERSEN MEDIA- Coming off of a tough weekend with the World of Outlaws in Calistoga, CA, Willie Croft and his team are geared up for a two-day show in Placerville, CA this Friday and Saturday night dubbed as the Nor-Cal Posse Shootout. 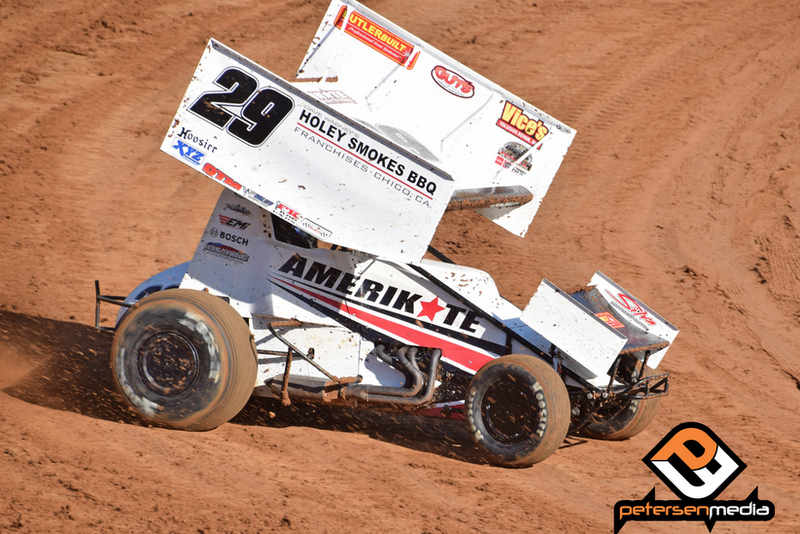 Placerville Speedway has been a track that Croft has had success at over the course of his career, but in 2017 things just haven’t gone his way at the ¼ mile bullring. With two more attempts at the high banked facility, Croft is confident his team will be in the mix all weekend long. 2017 BY THE NUMBERS: Races-38, Wins-1, Top 5’s-9, Top 10’s-16. ON TAP: Croft will be back in action on Friday and Saturday night at Placerville Speedway for the Nor-Cal Posse Shootout. PETERSEN MEDIA- Running a very patient race on Saturday night with the World of Outlaws Craftsman Sprint Car Series during the 64th Annual Gold Cup Race of Champions, Willie Croft would come on strong in the race’s final laps as he finished in the fifth spot. Timing the Holey Smokes BBQ/ButlerBuilt/Brown and Miller No. 29 entry in fourth quickest in his time trial flight, the Roseville, CA driver would run third in his heat race which locked him into the 40-lap finale. From the 11th starting position, Croft would be on the of the few who was able to get some spots early in the night as he would get up to ninth by the race’s seventh lap. Racing in a tight pack of cars on the tricky quarter mile, Croft would actually drift back as far as 13th just before the race’s halfway point. Using a restart, Croft would work his way back up to 11th at the halfway point, before taking over 10th on the 22nd circuit. Continuing to run in 10th, Croft would use a lap 28 restart to grab two more positions as he worked into the eighth spot, and a lap 30 restart would see him continue to move forward as he worked up to sixth. Croft seemed to get better as the race came to an end as he moved into fifth with just five laps to go, where he would go on to finish. Croft was also in action on Wednesday night with the Civil War Series, and had a really good night going. Timing in third quickest in time trials amongst the 44 cars that were checked into the pit area, Croft would go from fourth to second in his heat race and move into the Dash. Finishing fifth in the Dash, Croft would grid the field from the third row for the 30-lap Civil War Series season finale. Getting a good start, Croft would work into the third spot, where he ran when the first caution of the night flew on lap 18. With second having issues on the restart, Croft would take over the spot and promptly make a bid for the race lead when the action resumed. Amidst a four-car battle for the lead, Croft would have a mechanical failure send him through the infield and bring his night to an early end. “It was a disappointing end to our Wednesday night,” Croft said. “We had a car that was good enough to contend for the win, but unfortunately we broke. Good to have speed in both the 360 and 410 at Gold Cup, and hopefully we can run well with the Outlaws again at Calistoga Speedway. 2017 BY THE NUMBERS: Races-36, Wins-1, Top 5’s-9, Top 10’s-16. 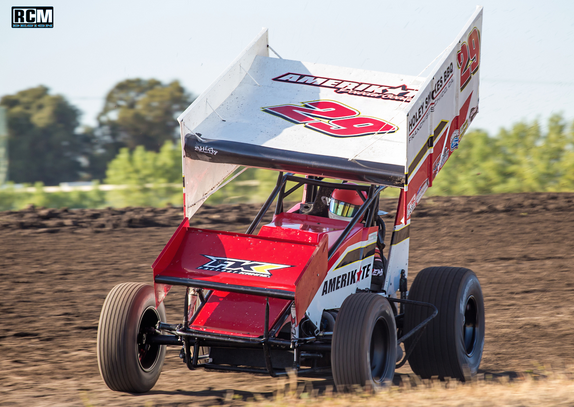 ON TAP: Croft will be back in action on Friday and Saturday night as he travels to Calistoga Speedway to battle the World of Outlaws Craftsman Sprint Car Series. Willie Croft had a good run on Saturday night with the Elk Grove Ford Sprint Car Challenge Tour pres. by Abreu Vineyards that culminated with a sixth place finish. Saturday night at Stockton Dirt Track, Croft got his night jumpstarted by timing the Holey Smokes BBQ/ButlerBuilt/Brown and Miller backed No. 29 machine in third quickest in his time trial group. By way of his time, Croft would line up on the front row of his heat race. While running second in his heat, Croft would have an engine issue force him back to hit trailer where his team would swap engines and get him ready for the semi. Going from sixth to second in the ‘B’, Croft would line up 18th for the 35-lap feature event. On the slick Stockton Dirt Track, Croft flexed his muscle early as he carved his way to the front with precision aboard a very strong Hinchman Indy/FK/Schoenfeld sprinter. Working well into the Top-10 before the race’s halfway point, Croft would work his way into sixth as the track started to take rubber. As the rubber continued to go down, Croft’s charge to the front would slow up a bit, but he would still take the checkered flag in the sixth spot after taking the green flag from 18th. Friday night also saw Croft and the WCR team in action with the SCCT as they checked in at Placerville Speedway. Setting the standard in his qualifying group, Croft would be the quickest qualifier in his group as he lined up in the second row of his heat race. Making a bid for the second and final Dash spot in his heat race, Croft would finish third and line up 11th in the 40-lap feature event. On the slick Placerville Speedway Croft just couldn’t seem to get going forward as much of the field planted their right rears on the thick cushion that had built up. Running in a tight pack much of the race, Croft would find himself 13th when the dust settled. 2017 BY THE NUMBERS: Races-33, Wins-1, Top 5’s-8, Top 10’s-15. 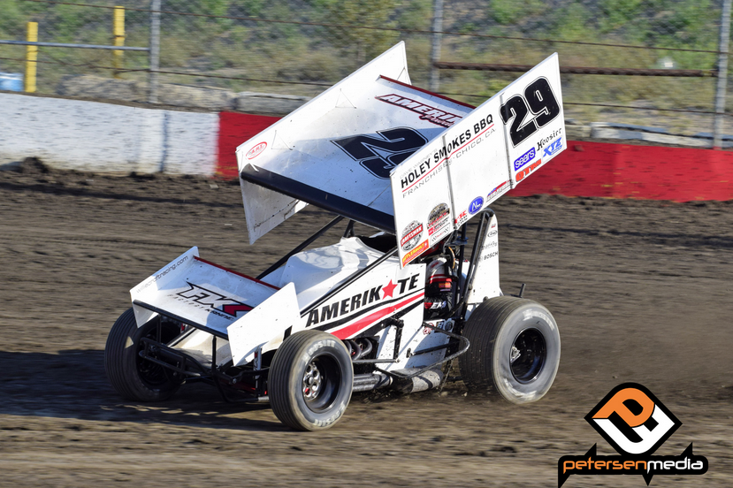 PETERSEN MEDIA- Saturday night, Willie Croft was in action with the Sprint Car Challenge Tour as they made their lone appearance of the season at Fernley 95A Speedway where he had another good points night that saw him finish in the eighth spot. Timing the Holey Smokes BBQ/ButlerBuilt/Brown and Miller backed No. 29 machine in third fastest in his qualifying group, Croft would take advantage of a front row starting spot in his heat race and pick up the win. By way of his win, Croft would earn a spot in the six-lap Dash, where a third place finish lined him up in the second row for the 35-lap feature event. On a slick surface that saw much of the field use the bottom groove, Croft would slip back to fourth as the field jockeyed for position in the opening laps. With not much passing going on as the leaders chased after the rear of the field, Croft would try to get around slower traffic and would end up losing a couple of spots in the process as he ran sixth. Getting back in the preferred grove, Croft would chase after the likes of Cory Eliason and Justyn Cox who ran in front of him until the caution flew on the 33rd lap and lined the field back up in double file formation. Lining up on the outside as he ran in sixth, Croft would drop back two more positions as he fought to get back to the bottom of the speedway. Back in eight, Croft would take a couple of shots under Mitchell Faccinto in the final two laps, but would end his night in the eighth position. 2017 BY THE NUMBERS: Races-29, Wins-1, Top 5’s-8, Top 10’s-14. 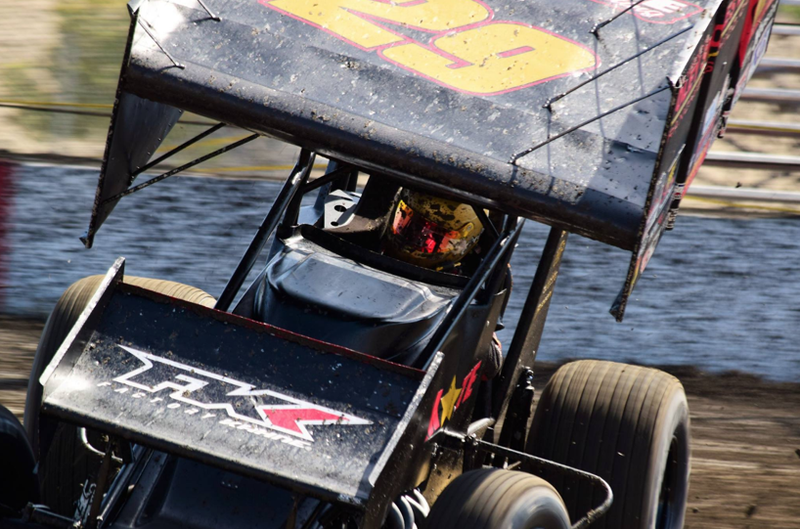 ON TAP: Croft is slated to invade Placerville Speedway on Saturday. Making the tow to Ocean Speedway over the weekend for the 7th Annual Howard Kaeding Classic, Willie Croft would take a bad tumble during the Dash on Friday night that essentially ended his night before finishing 13th on Friday night. Taking on the Civil War Series pres. by Flowmaster on Friday night, Croft would time the Holey Smokes BBQ/ButlerBuilt/Brown and Miller No. 29 machine in 14th quickest in time trials. Lining up on the front row of his heat race, the Roseville, CA pilot would pick up the heat race win and move into the six-lap Dash. The Dash would not go well for Croft as he would flip wildly down the backstretch. With the damage pretty extensive, Croft would do what he could to make it out for the feature event. Not quite 100%, Croft would take the green flag and pull his machine back to the pit area and continue to get his machine ready for the Saturday night event. Again timing in 14th quickest in time trials, Croft would again pick up the heat race win aboard the FK Rod Ends/Hinchman Indy/Factory Kahne backed machine. Moving into the Dash, Croft would line up in the 11th position and finish 11th and line up in the sixth row for the 30-lap feature event. With the track holding up a little too good after pre-race track work, Croft, like much of the field, would have a hard time moving around on a the fast surface. Trying to make something happen during the 30-lapper, Croft would end up with a 13th place finish. 2017 BY THE NUMBERS: Races-28, Wins-1, Top 5’s-8, Top 10’s-13. ON TAP: Croft returns to SCCT action on Saturday July 29th in Fernley, NV. PETERSEN MEDIA- Saturday night in Calistoga, CA, Willie Croft would overcome some mid-race adversity to finish in the 11th spot after being forced to the tail end of the field. “We just don’t seem to have the best of luck on our side right now, but glad we had the speed to move forward like we did,” Croft said. 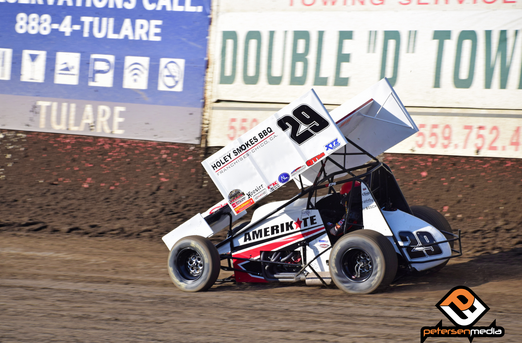 Taking on both the Sprint Car Challenge Tour and King of the West Series on Saturday night in Calistoga, CA, Croft would time the 360 car in third fastest in his time trial group. Turning in a strong performance in his heat race, Croft would pick up the win aboard the Holey Smokes BBQ/ButlerBuilt/Brown and Miller backed No. 29 machine and punch his ticket to the Dash. Lining up on the front row of the Dash, Croft’s second place finish would put him on the front row of the 30-lap $10,500-to-win feature event alongside Dominic Scelzi. Not getting the start he was hoping for, Croft would lose a few positions but was able to race his way back up to the second spot in the first five laps of the race. Running in second when the race’s first yellow flag flew on the 15th lap. Falling back to third when the race came back to life, debris would get into the hood of Croft and it would result in broken body panels and a slowing No. 29 machine. Restarting from the tail end of the field with just 10-laps to go, Croft would get everything he could out of his machine as he was able to work his way back up to the 11th spot at the checkered flag. In 410ci action, ‘Double Down’ would time in seventh quickest in time trials before record a fourth place finish during heat race competition. Missing the Dash by just one position, Croft would grid the field from the 11th starting spot for the 25-lap ‘A’. On the slick ½ mile, passing would prove to be tough in the feature event, but Croft would get a couple of positions early as he ran in the ninth spot. A yellow with five laps to go would see the leader and second place cars each have issues and Croft would take advantage of the track position as he went on to close his night out with a seventh place finish in the 410 program. 2017 BY THE NUMBERS: Races-24, Wins-1, Top 5’s-6, Top 10’s-11. ON TAP: Croft returns to SCCT action on Sunday night as he is scheduled to compete at Stockton Dirt Track. 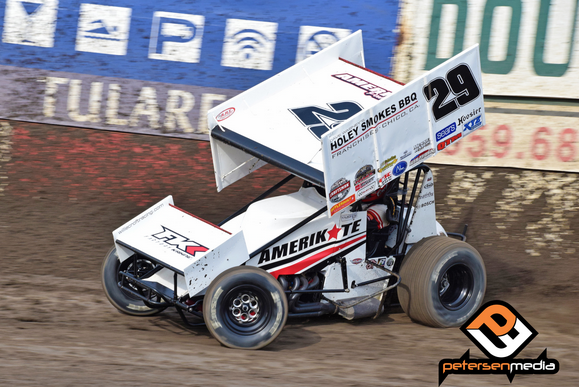 PETERSEN MEDIA- Traveling to Tulare, CA on Saturday night for the King of the West Series’ final visit of the 2017 season at Thunderbowl Raceway, Willie Croft would record a Top-10 finish. Timing the Holey Smokes BBQ/ButlerBuilt/Brown and Miller backed No. 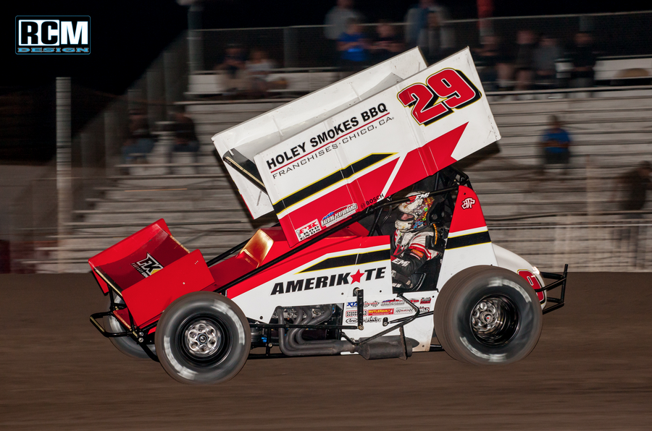 29 sprinter in ninth fastest on Saturday night, Croft would line up in the fifth position during heat race action. Finishing fifth after an exciting battle with Mitchell Faccinto, the Roseville, CA driver would line the FK Rod Ends/Hinchman/Factory Kahne entry up in the fourth row of the 30-lap feature event. A very slick Thunderbowl Raceway surface would present itself to the field for the 30-lap feature event and as things got underway, Croft would get up to the sixth spot in the opening five laps before the lone stoppage came by way of the red flag. When the action picked back up, rubber would soon start going down on the speedway as Croft battle with Kyle Hirst and Cory Eliason. The trio of heavy hitters would battle hard until they were forced to get into single file formation with Croft on the short end of the stick and back in eighth. Laps would click off and passing would be non existent on the single file track, as Croft was stuck back in eighth where he would ultimately take the checkered flag. 2017 BY THE NUMBERS: Races-20, Wins-1, Top 5’s-6, Top 10’s-9. ON TAP: Croft is tentatively scheduled to take part in the Tarter Memorial on Friday night in Chico, CA before traveling to Antioch, CA on Saturday with the SCCT. 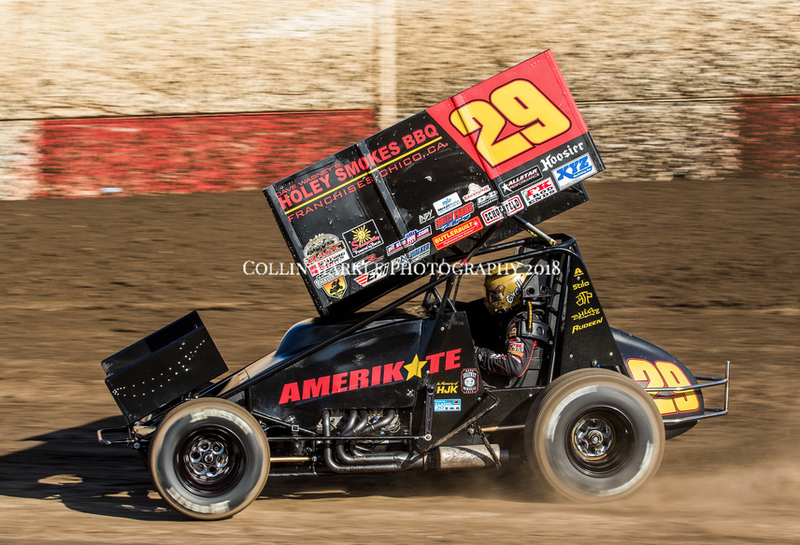 PETERSEN MEDIA- Taking on the King of the West Series on Saturday night in Antioch, CA to kick off a busy month of June, Willie Croft would come away with a fifth place finish. Timing his Holey Smokes BBQ/ButlerBuilt/Brown and Miller backed No. 29 machine in second fastest in qualifying time trials, Croft would run into problems on the start of his heat race. Trying to make the top side work in turns three and four, Croft would spin out and wind up finishing fifth. Missing out on a Dash spot, the Roseville, CA pilot lined up seventh in the feature event on what was an extremely slick surface. With cautions falling on lap two and lap five, Croft would use the two single file restarts to his advantage as he would pick up a spot both times as he took over the fifth spot. Chasing after Kyle Hirst and Cory Eliason who ran in front of him, rubber would continue to go down on the track lap after lap, and passing would become more and more difficult. Spending much of the race running through slower traffic, Croft would get to Hirst’s bumper on a couple of occasions but didn’t take too many risks as he kept himself in the rubber as the laps clicked off. A late restart with five to go would give Croft a shot at picking up a couple more positions but he couldn’t make anything stick as he closed the night out with a fifth place finish at the checkered. 2017 BY THE NUMBERS: Races-19, Wins-1, Top 5’s-6, Top 10’s-8. ON TAP: Willie Croft will return to action with the King of the West Series this coming Saturday night as series takes over Thunderbowl Raceway in Tulare, CA for one final time this season. PETERSEN MEDIA- Coming alive late in Saturday night’s Sprint Car Challenge Tour feature event in Stockton, CA, Willie Croft would make some late moves and score a second place finish. Timing the Holey Smokes BBQ/ButlerBuilt/Brown and Miller backed No. 29 machine in fastest in his qualifying flight, the Roseville, CA driver would line up in the second row of his heat race. Finishing fourth in his heat, Croft would advance to the feature event where he would grid the field from the 10th starting position. On the slick Stockton Dirt Track surface, Croft would bide his time early as he was a little on the tight side in the opening laps of the feature event. Chasing after the likes of Michael Kofoid and Bradley Terrell, Croft would get going during the back half of the race as he was able to start maneuvering around the 4/10 mile facility. Avoiding a couple of incidents that took place in front of him, Croft would work his way into the Top-Five as the laps continued to click down. Getting into the fourth spot as the leader ran out of fuel with just three laps to go, Croft would use a late restart to make up even more ground. Getting around Kyle Hirst to take over the second spot, Croft would then chase after Mitchell Faccinto for the race lead before the final caution flew. Hanging with Faccinto during the final laps, Croft would just not get close enough to take a shot for the win, and would end his night with a second place finish. 2017 BY THE NUMBERS: Races-18, Wins-1, Top 5’s-5, Top 10’s-7. ON TAP: Willie Croft will return to action with the King of the West Series this coming Saturday night as they invade Antioch Speedway. Looking to be in prime position to contend for his first King of the West win of the season on Saturday night, mechanical issues in the feature event would pester Willie Croft to finally pull off the track on the 23rd lap. Croft got off to a nice start on Saturday night in Tulare, CA as he timed the Holey Smokes BBQ/ButlerBuilt/Brown and Miller backed No. 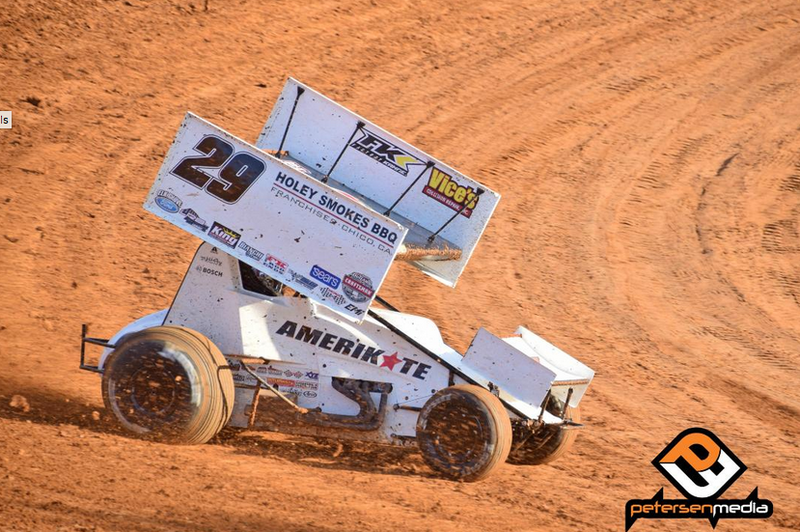 29 sprinter in eighth quickest during qualifying time trials. Heat race action would see Croft hook up in an early battle with DJ Netto as they fought for the top spot on an extremely slick Thunderbowl Raceay surface. Holding on to second, Croft’s finish would move him into the six-lap Dash. Grabbing the win, Croft would line up on the pole for the feature event as he looked to grab his second consecutive Faria Memorial feature event win. Falling into the second spot when the race came to life, Croft would slowly lose positions as he struggled to make speed as he complained of issues under the hood of his car. Trying to keep his wheels spinning to keep his engine running, Croft would continue to fight issues and finally pulled his machine back to the pit area on the 23rd lap when the race’s lone caution flew. 2017 BY THE NUMBERS: Races-17, Wins-1, Top 5’s-4, Top 10’s-6. ON TAP: Willie Croft will get right back to racing this weekend as he set to travel to Stockton, CA on Saturday night with the SCCT. Bouncing back from a sub-par showing at the Dave Bradway Memorial, Willie Croft would battle up front during Saturday night’s KWS-NARC Fujitsu Racing Series feature event before taking the checkered flag in the fifth spot. Timing the Willie Croft Racing No. 29 mount in second fastest in qualifying time trials, Croft would finish third during heat race action and earn a spot in the all important KWS-NARC Dash. With the inversion draw going his way, Croft would line up on the front row of the six-lap shootout. Finishing in the second spot, Croft would then find himself on the front row of the feature event as he started alongside Gio Scelzi. The waiving of the green flag would see Croft settle into the second spot as he chased after Sean Becker who jumped out to the early lead. The early goings of the feature event would be slowed by stoppages, though Croft would continue to run second on the slick surface. When things got going, traffic instantly came into play as the lead drivers moved all over the speedway navigating slower cars. Going both high and slow, Croft would take a couple of shots at Becker, though he would have his hands full with Kyle Hirst, Bud Kaeding and Gio Scelzi at times. Aside from the leader, the lead pack seemed to trade spots in every corner on the racy ¼ mile speedway. During the final two restarts, Croft would lose a couple of positions as he tried to make something happened and it would result in him finishing in the fifth spot. 2017 BY THE NUMBERS: Races-16, Wins-1, Top 5’s-4, Top 10’s-6. ON TAP: Willie Croft will return to action on Saturday night as he travels to Tulare, CA with the King of the West Series. Using a green-white-checkered restart at the end of Saturday night’s SCCT feature event in Petaluma, CA, Willie Croft would get by Colby Copeland to pick up his first win of the 2017 season, and first ever with the upstart series. “The F&F Racing team had a really good car all night long, but we were able to take advantage of a late restart and ended up with the win,” Willie Croft said. On a picture perfect day for racing that featured brilliant sunshine and a taste of Summer, Croft got his night started off by timing the Holey Smokes BBQ/Brown and Miller/FK Rod Ends backed No. 29 machine in fastest in his qualifying group. Finishing second in his heat race, Croft would move into the Dash where the eight pill would line him up in the fourth row. Making the high-side work to his advantage, Croft would work his way up to finish in the third spot and line up in the second row for the 40-lap feature event. On a traditional hooked up and rough Petaluma Speedway, Croft would quickly work into the second spot as he began his race long pursuit of Colby Copeland. Feeling pressure from Shane Golobic for the second spot at times, Croft would continue a hard nosed approach that saw him reel in the leader as the race clicked off in lightening fast fashion. The 33rd lap would see Copeland bobble out of turn four, and Croft was right there the pounce and take over the lead, only to see Copeland answer back on the 35th circuit. A yellow on the 39th lap would bunch the field up for one last double file restart, as they were set up for a green-white-checkered shootout to the finish. When the green flag dropped, Croft was hard on the throttle and muscled his way into the lead. Leaving Copeland the field in his wake, Croft would go on to pick up a very hard fought win. 2017 BY THE NUMBERS: Races-14, Wins-1, Top 5’s-3, Top 10’s-5. ON TAP: Willie Croft will now set his sights on the annual Dave Bradway Jr Memorial weekend that takes place in Chico, CA this Friday and Saturday night. 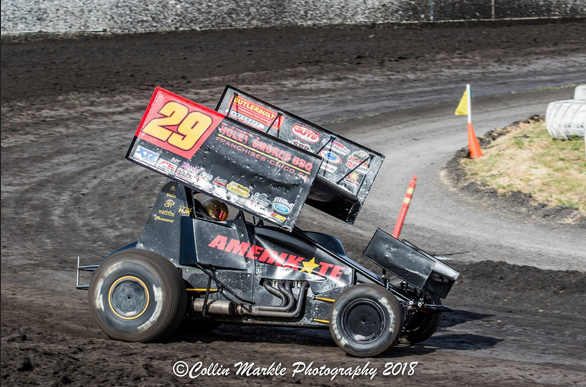 Willie Croft looked to be in prime position to battle up front during both night’s of the Peter Murphy Classic, but two frustrating feature events have him looking forward to Petaluma Speedway on Saturday night. Croft’s weekend got underway in Tulare, CA on Friday night as he timed the Holey Smokes BBQ/Brown and Miller/FK Rod Ends backed No. 29 machine in third fastest in his qualifying group. Lining up on the front row of his heat race, Croft would get the jump over Steven Tiner, and proceed to pick up the win and advance into the night’s Pole Shuffle. During the match race, Croft would take on Rico Abreu in the first round and would come up short and be relegated to the 12th starting position for the 35-lap feature event. Getting into the 10th spot in the race’s first 11 laps, Croft looked to be one to watch from the middle of the pack as he looked to be one of the only ones who could move around. With the race’s second yellow coming at the halfway point, Croft wouldn’t be quite the same when the race resumed. Struggling to make traction, Croft would slip back and end up finishing in the 16th spot. Saturday night Croft and team would bolt in their 410ci engine to take on the KWS Fujitsu Racing Series in the Peter Murphy Classic finale. Timing in second fastest in flight a, Croft would just narrowly miss out on bonus money that was up for grabs during time trials. Lining up in the second row of the night’s second heat, the Roseville, CA driver would make a couple of big moves to pick up the win and make himself eligible for the Pole Shuffle. 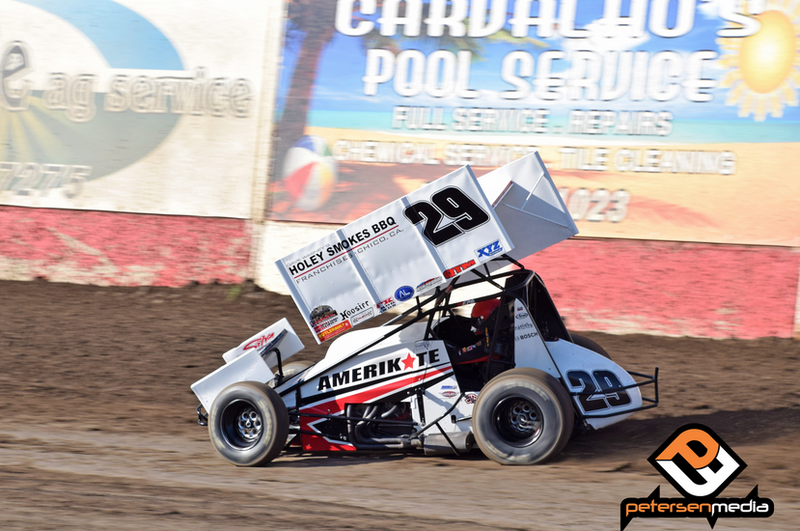 Defeating Michael Kofoid in his first match, Croft would then come up just short to Bud Kaeding as he tried to get on the front row but would settle for the third starting spot in the night’s 30-lap Peter Murphy Classic feature event. With rubber going down on the track during the wingless feature, track crews would rework the surface during driver introductions, and it gave teams something to think about in a short amount of time. Croft and company thought the work would hold up for a few laps before starting to go slick again, but unfortunately that would not be the case. With the track staying fast, Croft would simply be too tight in the feature and would pull his front wheels up off the ground regularly through the night. When the race came to a close, Croft would slide back and finish 10th. 2017 BY THE NUMBERS: Races-13, Wins-0, Top 5’s-2, Top 10’s-4. ON TAP: Willie Croft will follow the Sprint Car Challenge Tour to Petaluma Speedway on Saturday night. 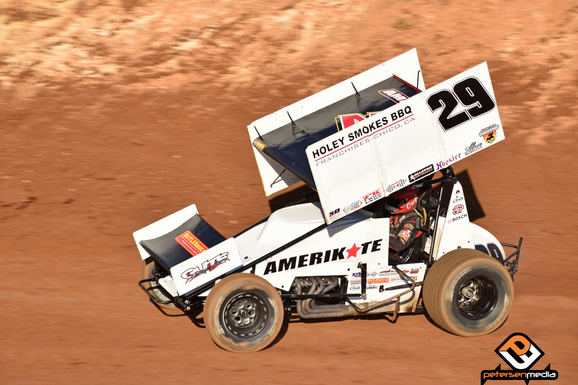 Continuing to show great speed the last few weeks, Willie Croft put on a dazzling performance at Placerville Speedway on Saturday night as he worked his way forward from the 20th starting position to finish in the sixth spot. Timing the Holey Smokes BBQ/ButlerBuilt/Brown and Miller backed No. 29 machine in third fastest in his qualifying group, Croft would find himself on the front row of his 10-lap heat race. Finishing fifth in his heat, the Roseville, CA driver would be forced into the B main event. Finishing fourth in the semi, Croft would advance to the 40-lap feature event where he would grid the field from the 10th row. On an extremely slick Placerville Speedway surface, Croft was able to guide his machine forward as he was able to move all over the racing surface. Simply going where there was open real estate while mired in dense traffic, Croft was showing the capacity crowd he was on a mission. Taking advantage of a couple double file restarts, Croft would find himself battling with Ryan Bernal for a spot in the Top-Five during the race’s closing laps. With the duo exchanging the spot several times, Croft would end up taking the checkered flag with a sixth place finish. “We definitely want to take advantage of starting up front in our heat race and making the Dash, but other than that I was pleased with how we performed in the race,” Croft said. 2017 BY THE NUMBERS: Races-11, Wins-0, Top 5’s-2, Top 10’s-3. ON TAP: Willie Croft will be back in action on both Friday and Saturday night in Tulare, CA for the Peter Murphy Classic. For the second year in a row, Willie Croft looked to be well on his to winning the season opening KWS event. In 2016 a late incident in traffic knocked him out of contention, and on Saturday night he was simply dominant until issues on lap 28 forced him into the pits. The first car to ever take a qualifying lap on the 1/3 mile facility in Bakersfield, CA, Croft would end up timing his Holey Smokes BBQ/BulerBuilt/Brown and Miller backed No. 29 machine in third quickest in the session. Lining up in the second row of his heat race, the Roseville, CA wheelman would do a little moving and shaking as he would finish in the second position and advance to the nightly Dash. With the inversion pill being a ‘0’, Croft would line up on the front row of the six-lap shootout and by way of the win, he would line up on the pole for the 30-lap feature event. Having lane choice for the initial start, Croft would opt for the outside lane as he had taken a liking to the track’s high groove. When the green flag dropped, Croft was hard on the throttle as he jumped out to the early lead and quickly opened up a sizeable gap on the rest of the field. A couple of timely cautions on laps six and 15 would get Croft out of traffic and into clean air, as he continued to show the way and simply dominate the race. Never seriously challenged in the race’s first 27-laps, Crofts machine would sputter on the 28th lap as the red flag quickly flew for an un related incident. Sitting on the backstretch under the stoppage knowing his machine was empty, Croft held out hope officials would open the red to pit crews. Not quite that lucky on this night, Croft would relinquish the lead as he had his machine pushed back to the pits. 2017 BY THE NUMBERS: Races-10, Wins-0, Top 5’s-2, Top 10’s-2. ON TAP: Willie Croft returns to action on Saturday night in Placerville, CA. Willie Croft had himself a great night with the Sprint Car Challenge Tour during their first ever race on Saturday night in Antioch, CA. Besting a healthy field of 58 cars in time trials, Croft would go on to finish fourth in the feature event. Croft would kick things off by timing in fastest in his qualifying group which was also the fastest lap of the night in time trials, and he would line his Holey Smokes BBQ/ButlerBuilt/Brown and Miller backed machine up in the second row of his heat race. Working his way up to finish second in his heat, the Roseville, CA driver would transfer into the feature event, and would also make himself Dash eligible. Lining up in the fifth spot of Dash No. 2, Croft would finish fourth which would place in on the outside of the fourth row for the 30-lap feature event. On racing surface that was less than desirable for drivers and teams alike, Croft was able to work his way forward. With several restarts bunching the field back up through the night, Croft would take advantage as he worked his way toward the Top-Five. When the wild race came to a close, Croft would take the checkered flag with a fourth place finish. Willie Croft and team were also in action with the World of Outlaw Craftsman Sprint Car Series on Wednesday in Placerville, CA. Having a tough go in time trials, Croft would end his night by finishing ninth in the Last Chance Showdown. 2017 BY THE NUMBERS: Races-9, Wins-0, Top 5’s-2, Top 10’s-2. ON TAP: Willie Croft will return to action on Friday night in Hanford, CA before opening up the 2017 King of the West season in Bakersfield, CA on Saturday night. Saturday night in Stockton, CA, Willie Croft was simply in the wrong place at the wrong time. With trouble breaking out on a lap eight restart, the Roseville, CA driver would have nowhere to go and his night would ultimately come to an early end. “It has not really been the start to the season that we had hoped for, but we will keep plugging away and look forward to Placerville, CA on Wednesday night,” Willie Croft said. Lining up in the fourth row of his heat race at the Stockton Dirt Track, Croft would get the hard part out of the way as his fifth place finish would move him straight into the 30-lap ‘A’ main event. With his heat race finish, the Roseville, CA driver would place his Holey Smokes BBQ/ButlerBuilt/Brown and Miller backed No. 29 machine in the ninth row for the feature on a lighting fast racing surface. Slowly working his way forward in the early laps, things would come to a screeching halt on the eighth lap. When the field headed down the front stretch to take the green flag on a restart, a wild wreck with break out and with nowhere to go, Croft would get a piece of the action and his night would come to an end. 2017 BY THE NUMBERS: Races-7, Wins-0, Top 5’s-1, Top 10’s-1. ON TAP: Willie Croft will return to action on Wednesday night in Placerville, CA and on Saturday night in Antioch, CA. Getting right back in the thick of things with the World of Outlaws Craftsman Sprint Car Series, Willie Croft would have and up and down trip to the Thunderbowl Raceway in Tulare, CA. 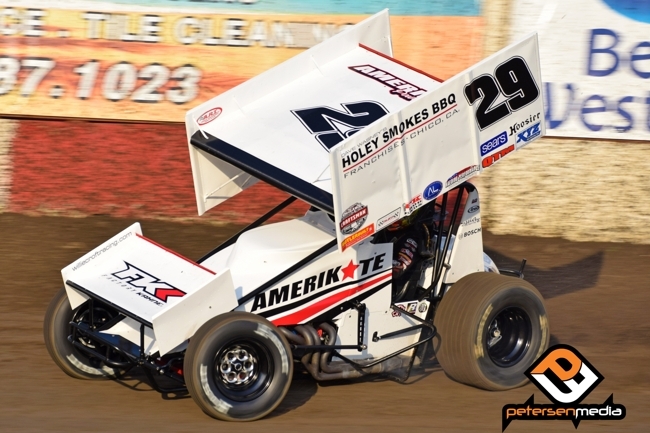 Friday night kicked off the two-night extravaganza in Tulare, CA, and the Roseville, CA resident would kick things off by timing in 12th fastest in qualifying time trials. Lining up in the second row of his heat race, Croft would battle with Carson Macedo and Brent Marks for position before settling for fourth and transferring the Holey Smokes BBQ/ButlerBuilt/Brown and Miller backed entry into the ‘A’ main event. On a track that was choppy in places, the action would pick up during the feature event. Battling for position inside the Top-10, Croft would catch the notorious Tulare rut in turns one and two and when his machine came back on all fours he would lose power and come to a stop. Not sure of the issue, Croft would push back off and tag the rear of the field but something wasn’t quite right and Croft would pull into the infield and go to work under his hood following the race. Back in action on Saturday night, Croft’s night would not get off to the start he was looking for as he would find himself on the back end of the speed chart following time trials. Finishing seventh in his heat race, “Double Down” would be forced into the night’s Last Chance Showdown where he would grid the field from the 12th starting spot. In the LCS, Croft came alive and began picking off cars at will. Getting into the fifth spot, Croft would need just one more position to transfer into the feature event. Battling with Brian Brown in the closing laps, Croft’s transfer bid would come up just short and his night would end with no transfer position. 2017 BY THE NUMBERS: Races-6, Wins-0, Top 5’s-1, Top 10’s-11. ON TAP: Willie Croft will follow the World of Outlaws to Stockton, CA this weekend for a two night program slated for Friday and Saturday night. While competing with the World of Outlaws in Las Vegas, NV last week, Willie Croft decided that he and his team would leave following Friday night’s event and head to Chico, CA and take part in the 2017 Silver Cup. Taking on the World of Outlaws on Thursday and Friday, Croft would open the two-day program up by timing the Holey Smokes BBQ/ButlerBuilt/Brown and Miller backed No. 29 entry in 15th fastest in his qualifying flight. Lining up in the eight starting spot of his heat race, Croft would grab a seventh place finish and move into the night’s Last Chance Showdown. Gridding the field from the 10th starting position on an extremely rough track, Croft would battle with fellow West Coast drivers, Bud Kaeding and Jason Solwold, before ending his night with a 10th place finish. Friday night would get off to a much better start for the Roseville, CA driver, as he timed his machine in ninth fastest during his qualifying flight. Starting and finishing fifth in his heat race, Croft would punch his ticket into the night’s feature event where he would line up in the 17th starting spot. As the race came to life, Croft would find himself in a bit of mayhem as he dodged a car spinning as well as other drivers trying to avoid the situation and lost several spots as a result. Able to gather himself back up, Croft would ultimately pull into the pit area on the fifth lap and get prepared for the trip to northern California. Driving through the night, Croft and his team would get back to the shop with enough time to change tires, and load the 360ci car up and hit the road to Chico, CA. In action with the Civil War Series presented by Flowmaster on this night, Croft get open the night up by timing in fifth fastest in qualifying time trials. Running third in his heat race, Croft would just miss out on a berth in the night’s heat race and would grid the field from the ninth starting spot for the 30-lap feature event. A rough and tumble Silver Dollar Speedway would make things tricky for drivers at times. On the fourth lap, Croft would get over the edge in turns one and two and keep his machine powered and ultimately return to the surface just as the caution would fly for a car that had stopped. What looked like a break for Croft turned into a questionable call that resulted in Croft not getting his spot back and opting to head back to his pit and end his night. 2017 BY THE NUMBERS: Races-4, Wins-0, Top 5’s-1, Top 10’s-11. ON TAP: Croft returns to action with the World of Outlaws on Friday and Saturday night in Tulare, CA. A busy winter for Willie Croft saw him kick his season off Friday night in Chico, CA. On an unusually slick surface that ended up taking rubber, Croft would close his night with a fourth place finish. Kicking the season off by timing the Holey Smokes BBQ/ButlerBuilt/Factory Kahne backed No. 29 machine in fastest during qualifying time trials. Lining up alongside Kyle Hirst in heat race action, Croft would settle for a second place finish and earn a place in the night’s redraw. Pulling the two pill, Croft would line his potent entry up on the front row of the feature event where he would again be alongside Hirst coming to the green. As the night went on, the track would continue to slick off and be tough to get traction in the early goings of the feature event. When the race went green, Croft and Hirst would battle for real estate on the bottom of the speedway as the Roseville, CA wheelman ran in the second spot. Falling back to third following an early restart, Croft would continue to stay committed to the bottom as he chased after Hirst and now DJ Netto. As the laps clicked of, the track would start taking rubber on the high side of the speedway, and as Croft changed lanes to find it he now ran in fourth. Once the rubber went down, action became single file and Croft would close his opening night with a Top-Five finish. 2017 BY THE NUMBERS: Races-1, Wins-0, Top 5’s-1, Top 10’s-11.